Great work! quickly became one of my newest favorites! wow i cant believe this thread has stalled, any progress? Prophetic, at least so far! A bit of an update for anyone who's still around. I am pretty bummed that this place has turned into a ghost town. Facebook might be handy to ask a quick question or sell something but it's all so ephemeral. These forums provide such a wealth of knowledge and that is being abandoned for something that is the epitome of instant gratification. There is no "community knowledge" or really even any community anymore. Shame! Things for me as well have changed a bit since I last posted progress here. Kiddo #5 is 6 weeks old. Numerous other vehicle projects have come and gone. I still have the Supra, though she is a bit ashamed of herself for being so very stripped and neglected. What I also have now is a 26'x36' heated shop that I recently finished. What I still don't have is a lot of time, though I do have some occasional help via cheap labor in the form of college-age minions. 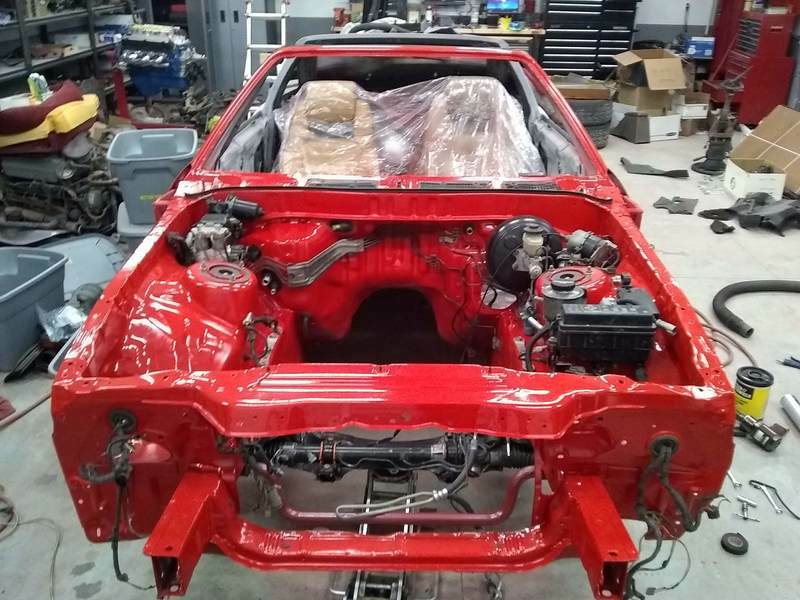 I've slowly started working toward finishing this car again. This past spring I picked up a nice dash while in Oregon on vacation. She has a dashboard again for the first time in 7 years. I've started accumulating some parts, starting with the brakes, as she has been without brake calipers this whole time as well. 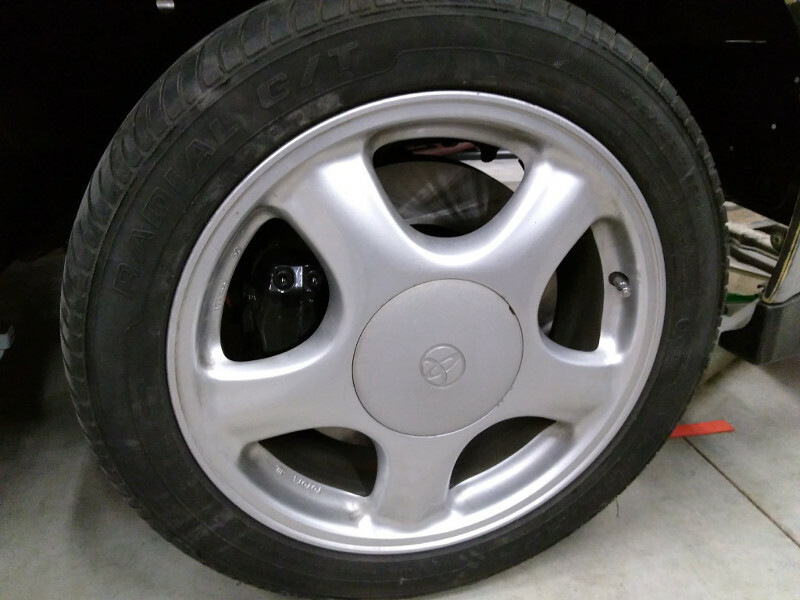 Stella recently shed her 15" SC300 rollers with missing center caps and "unsafe but holds air" all-seasons and got a set of nice MKIV TT wheels complete with good (though a few years old) rubber that I scored for $150 locally. I sold the old wheels for $50 right away, so not a bad upgrade for $100. She also has Mercedes front calipers and 330mm/13" rotors now, albeit in "dry-fit" mode. But hey, it's something. The wheels are still only temporary as I'll need to do something different to fit the widebody, but at least they fit over the brakes, which the 15" SC wheels had no chance of doing. 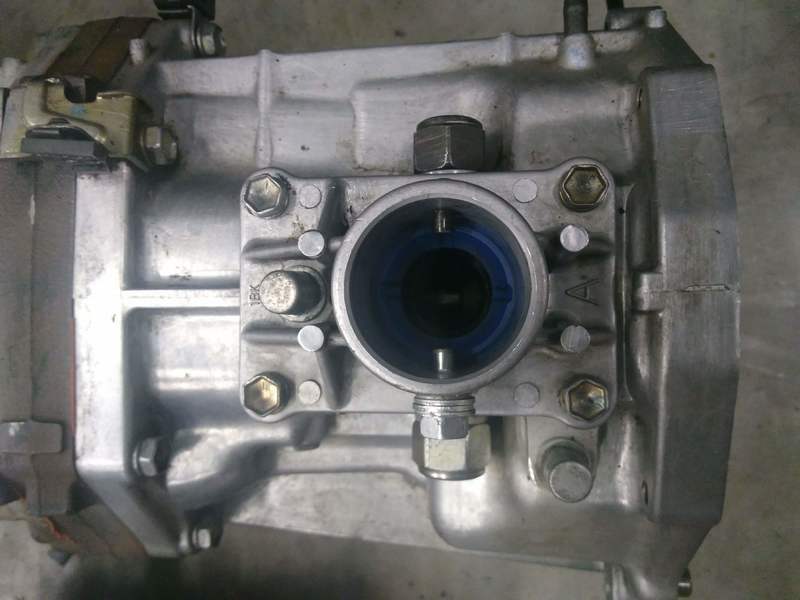 I've started putting together some parts to swap in an AR-5 (Solstice) transmission, and just today I ordered another V1 AEM EMS to replace the one that I had previously. 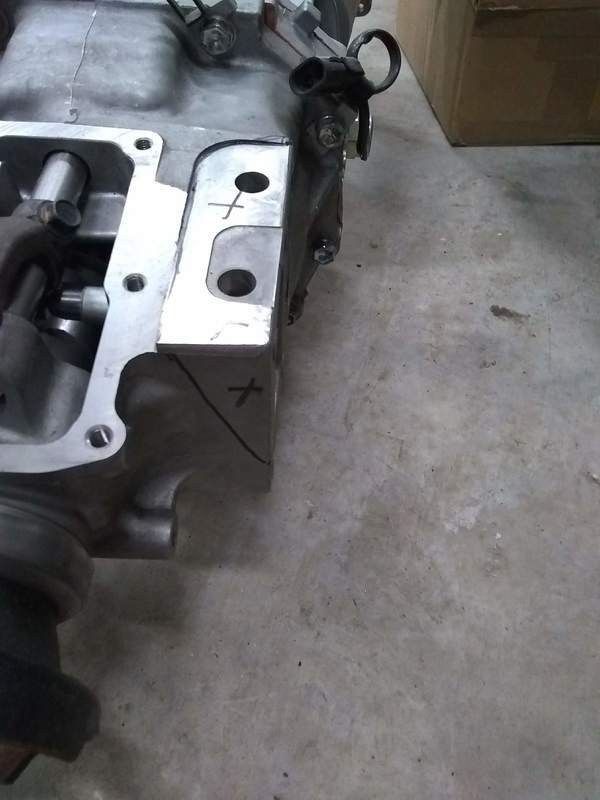 I also picked up a set of Evo calipers for the rear but I am probably going to re-sell those as I have 62mm MKIV rear hubs and rotors already installed so MKIV TT rear calipers will be a more direct route. 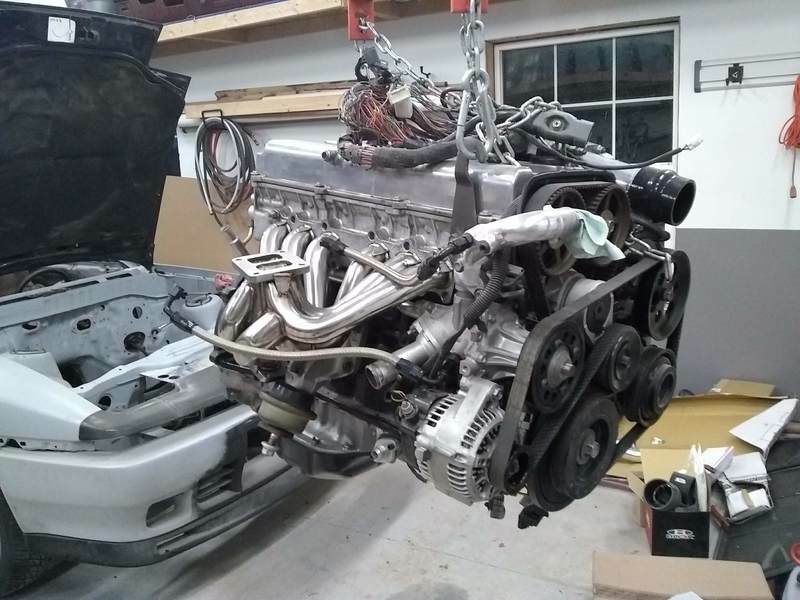 I am considering swapping in a 2JZ-GTE VVTi/auto and just keeping it stock as a quick route to getting it going. 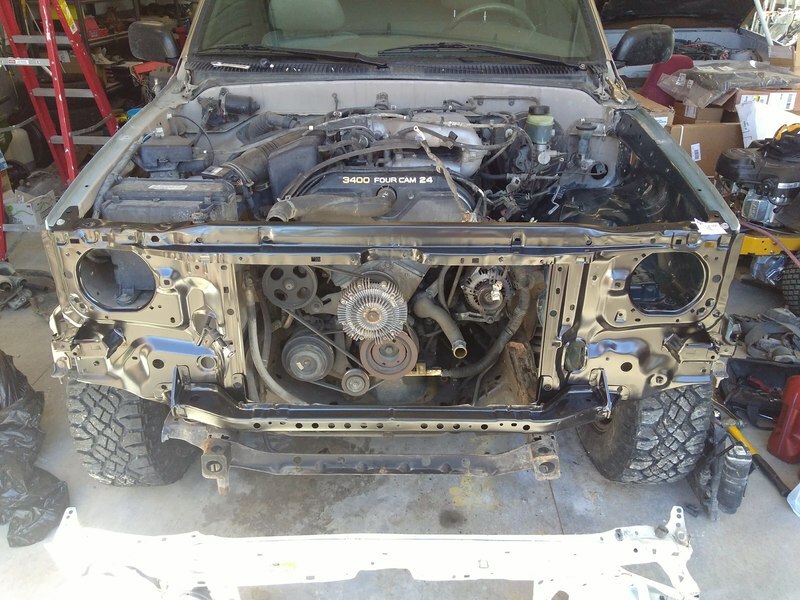 But I'm not sure that I'm any further away with the 1JZ that I already have that was already set up for this chassis. So that is still up in the air, it is possible that I will go that route still and save the AR-5 for a later project. My goal is to get her back on the road by next spring. The feasibility of this of course depends on time and budget. 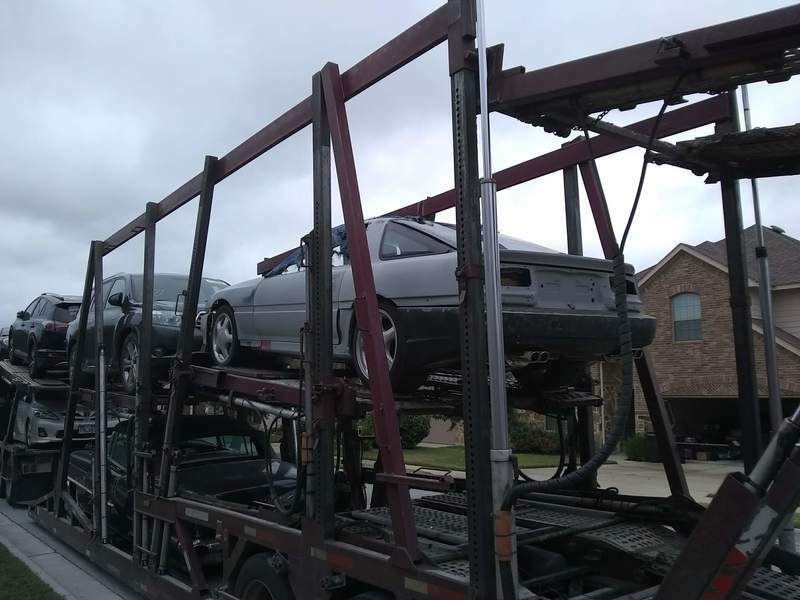 We are also considering moving back to the Austin area, so that gives me another reason to have it done, and one that my wife is actually on-board with, or at least she tells me at the moment: moving a disassembled car across the country is not something we'd like to do again. I do have a lot of body work left to do, then paint. 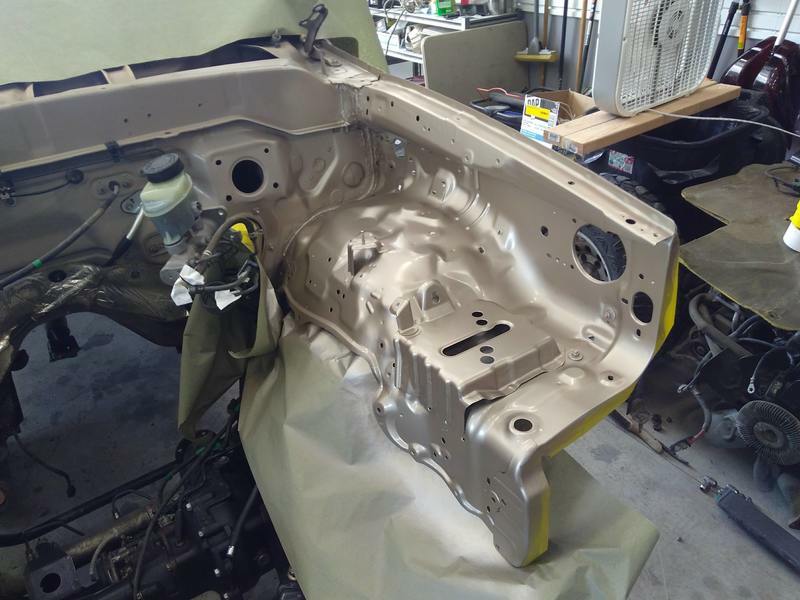 I was planning for the longest time to paint it back to the factory 206 black with red pearl color, but I am thinking now of either 3E5 (Super Red), or one of the FJ Cruiser colors, 3L5 (Radiant Red) or 5A3 (Sun Fusion) yellow. I sold the carbon targa and hood that I had so I have less reason to stick with my original color scheme plan. 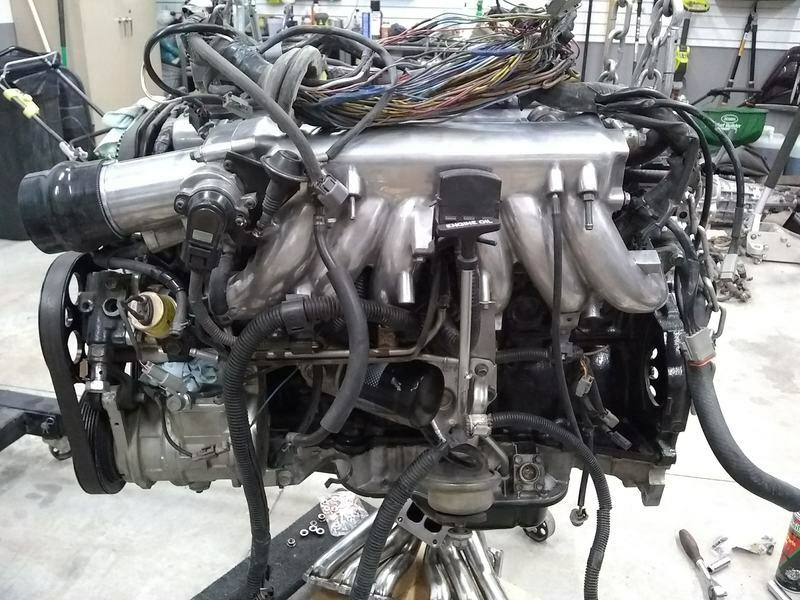 I've pushed the images from my last backup of 1jz.com before I let it go up to AWS and updated the rest of this thread so the images in most of the past posts should be working now. I decided to stick with the 1JZ, and may bump to 1.5JZ down the road. Sorry I don't have actual pics right now, but I'll throw in some links for good measure. 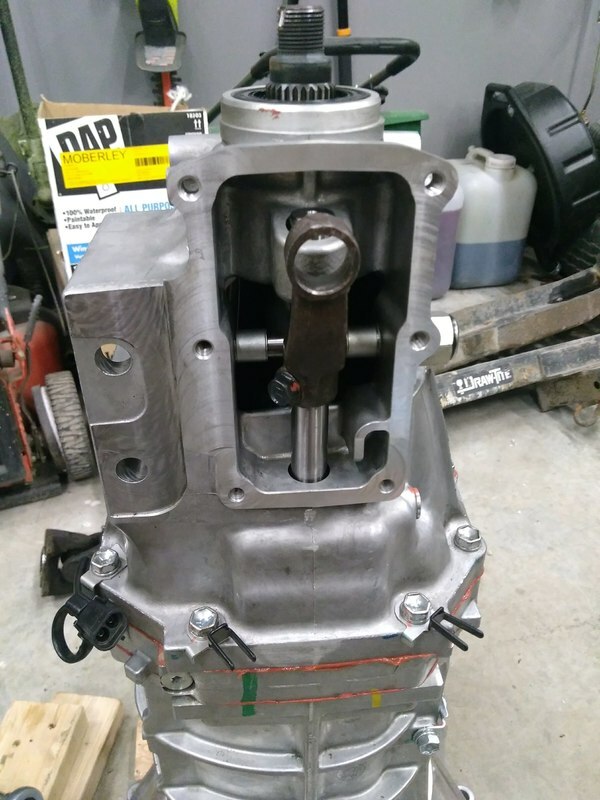 I ordered a brand new AR5 transmission, with interim design change but I will be fabbing a bracket that will allow it to use a standard R154 mount. I went with the new one because there are none available in yards around here, and with freight to Montana, the price difference is only $200. Might as well have a new one. 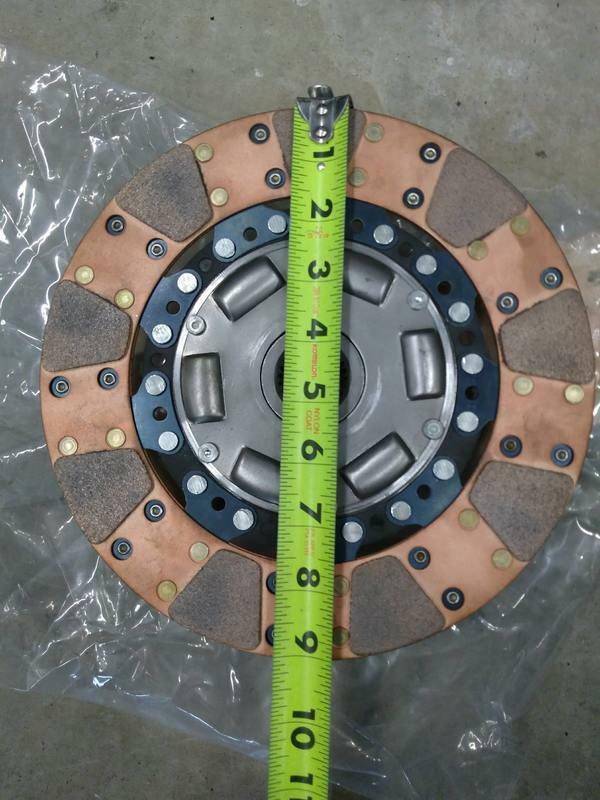 Going with a stock pressure plate and this disc. Should be sufficient for my modest power goals. 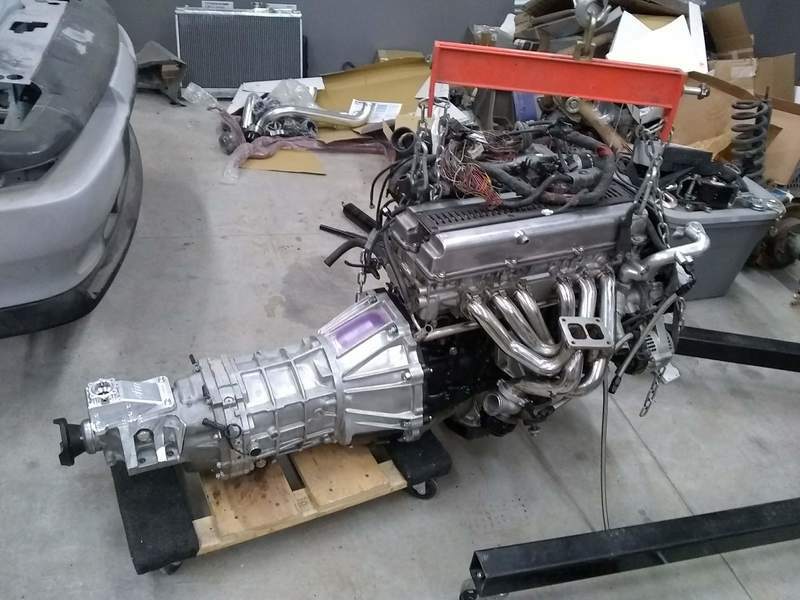 Also ordered a GT3076, this time a clone. 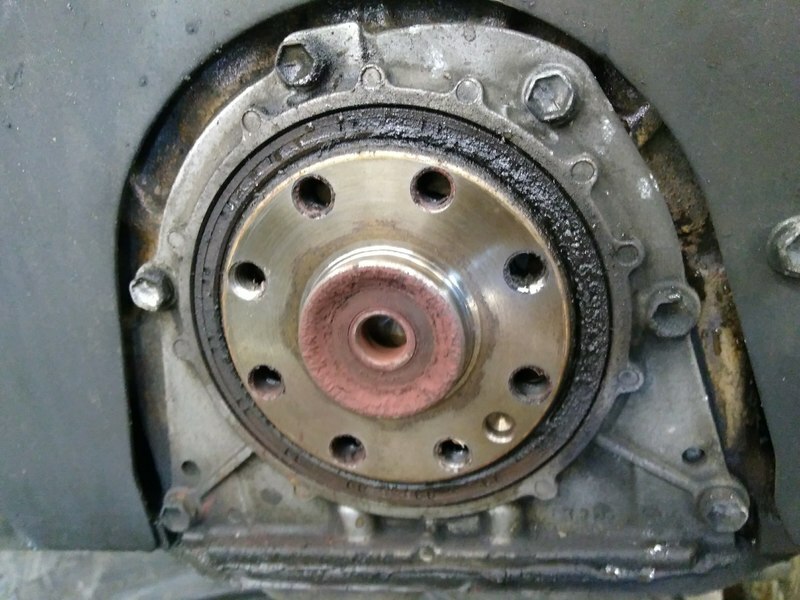 Went journal bearing but billet wheel. Budget doesn't allow for a Garrett DBB unit this time around. 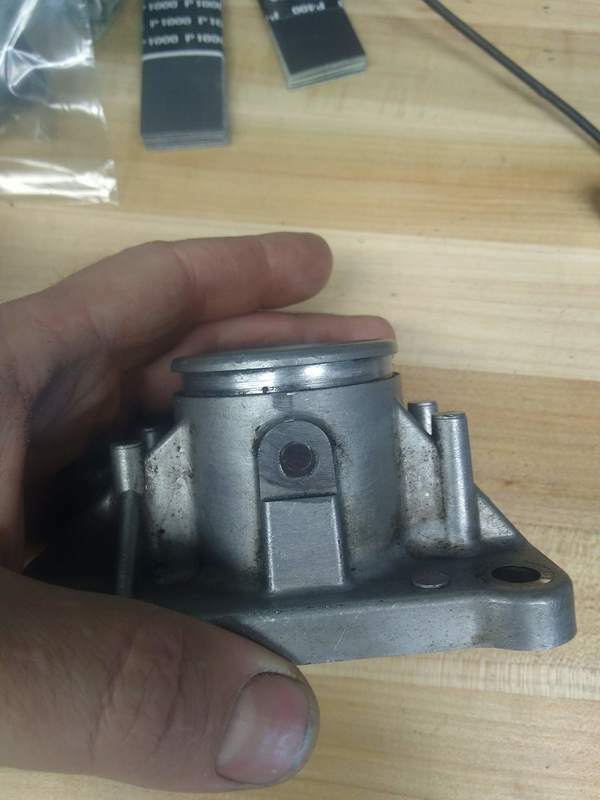 I ordered a twin-scroll turbine housing as well. Ordered another of the same cheapo manifold that I had used the first time around, though the V-Band version was not readily available this time. I'll be using another 44mm V-Band wastegate so I'll cut and weld on a V-Band flange. 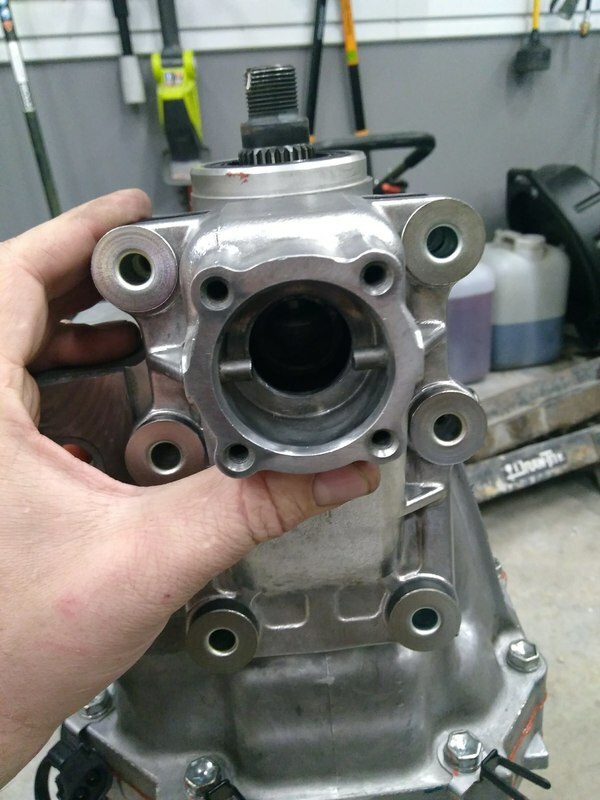 That manifold still has the same fitment issue with the front wastegate feed, so the "clearancer" hammer came out and it is once again solved. 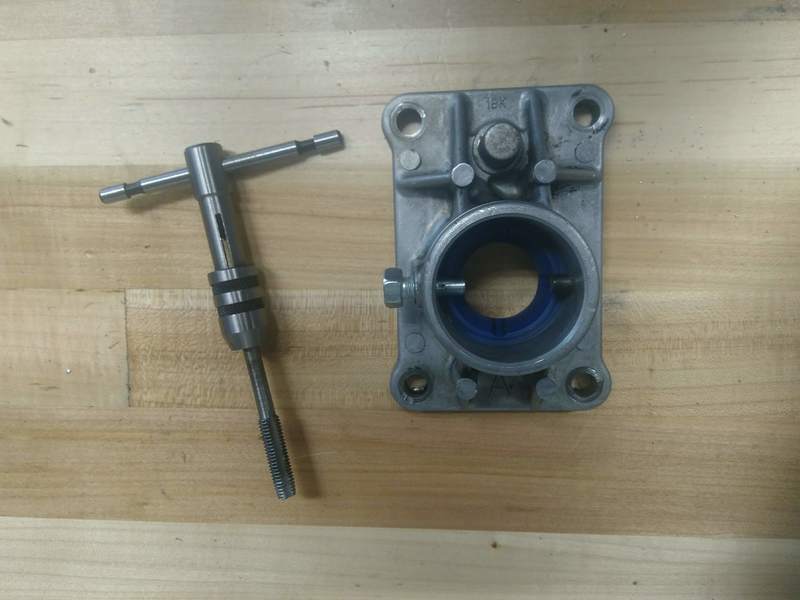 Now there are adapter plates available for divided T4-T3, this simplifies things as I had previously modified the T4 flange to T3 with some careful welding, drilling, and the assistance of a flycut from a buddy that worked at a machine shop. I no longer have that hookup or as much time to invest, so the adapter plate is appreciated. I'm going to focus on repairing my wrecked Tacoma now, so this won't have much attention for a while. 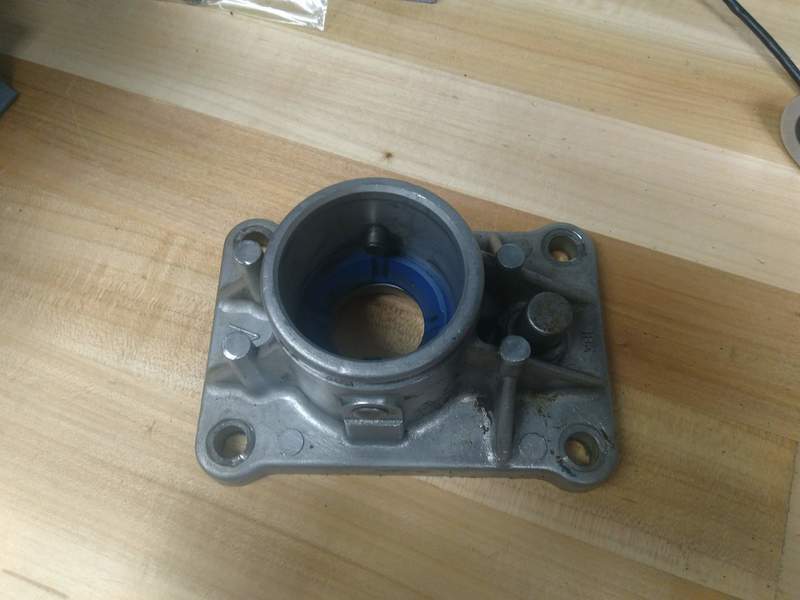 Got my turbine housing yesterday (overnightDHL parts from JapanTaiwan)! I went out to the shop at lunch and did a quick mock-up. Here you can see the "fixed" clearance issue with the front WG runner. Still waiting on my T3-T4 adapter plate from Taiwan. 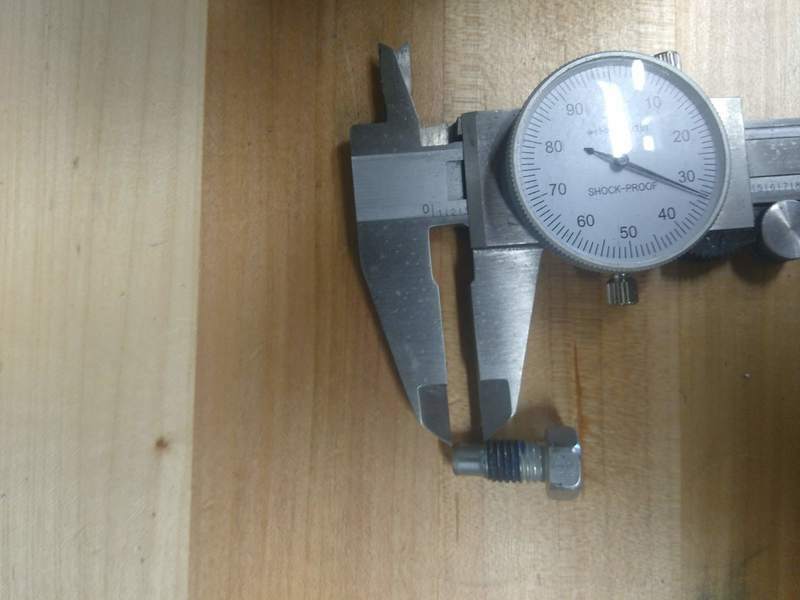 I bought a USA made one but the bolts had the wrong thread pitch (m10x1.50, needed m10x1.25) and the seller didn't have a source for the correct bolts, nor could I find them, so back that one went. The Mamba one from Taiwan comes with both coarse and fine bolts. Plenty of room in the back. I contemplating wastegate options. I have a 44mm on order but I may scratch that and do dual 38mm which will be more optimal for twin scroll. 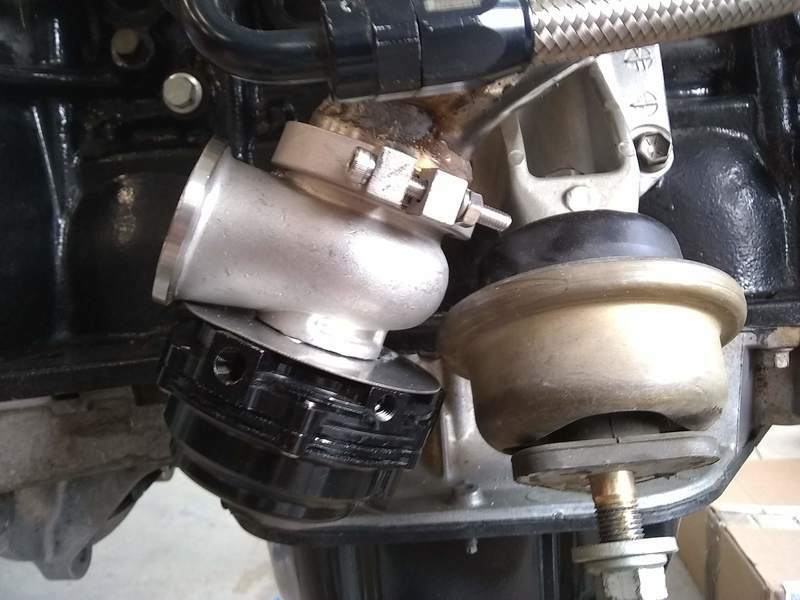 I could just hack off the existing wastegate feed and come slightly up with it and do either a divided collector or dual wastegate setup just behind the turbo. I never did like putting a nice wastegate down by the ground anyway. I am thinking either recirculated at the bottom of the downpipe (shallow angle merge) or open dump into one or two Supertrapp or similar. 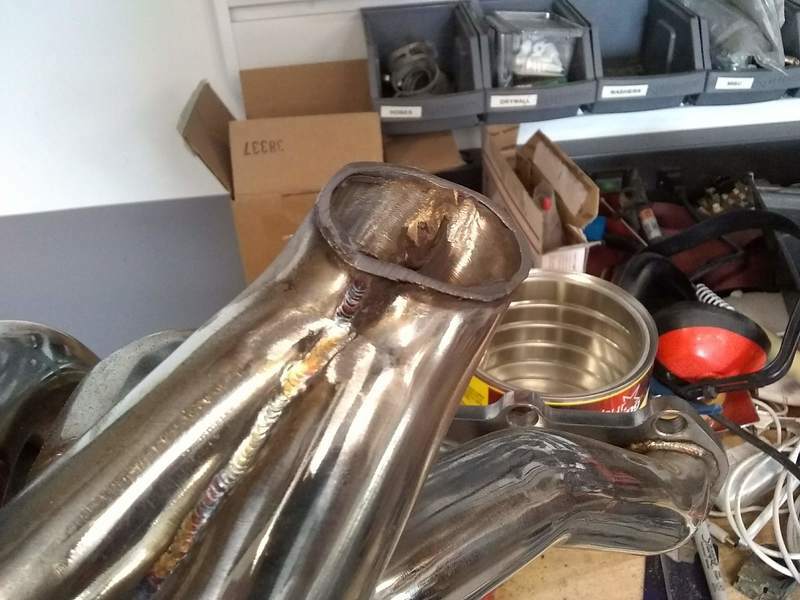 Coming up instead of down (or at least straight out) with the wastegate feeds would also get rid of that awful nearly-180 degree turn that the exhaust has to make to feed the wastegate, potentially causing boost creep. I know that's just the name of the game with cheap manifolds but I really can't justify a high dollar one. On another note, I picked up a new welder today. 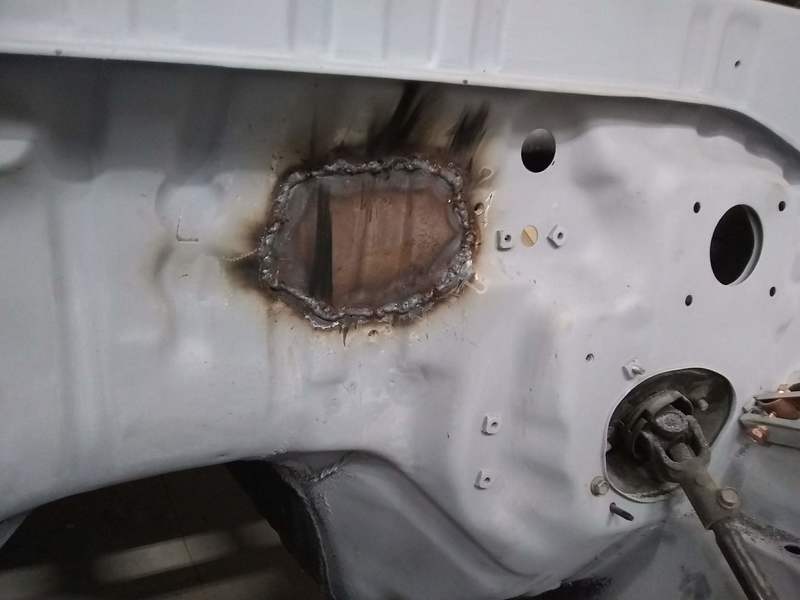 I figured with all the welding I had coming up, (Tacoma repair, finish Supra exhaust, Flareside truck mods, etc) my modded "Dual Mig 151" might need to be put out to pasture. I've been having wire feed consistency issues with it lately and I'm tired of fiddling with it. I've done lots of mods including a new higher end liner and it still won't feed smoothly at slow speeds. 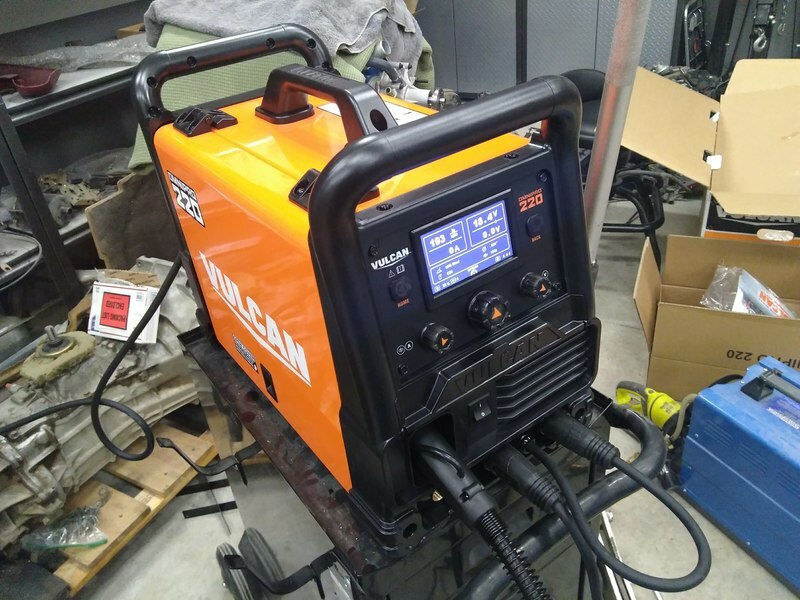 I also want to learn to TIG better and no longer have access to one, so I picked up a Vulcan OmniPro 220 multi-process welder today. Harbor Freight is really stepping up their game based on what I've read about these. Going to give it a shot. It's a DC only TIG so it won't do aluminum, but my thinking is that I can get the hang of it with this one on stainless and then if I really want to get into it with aluminum, pick up up the ProTIG later on. With the coupon, the OmniPro was only $150 more than the comparable MIG-only welder so it seemed like a good buy to have stick and TIG options as well. Though a TIG torch and foot pedal are separate purchases at $80/ea so I'm still on the fence as to whether I should have just bought the AC/DC TIG and made that jump. 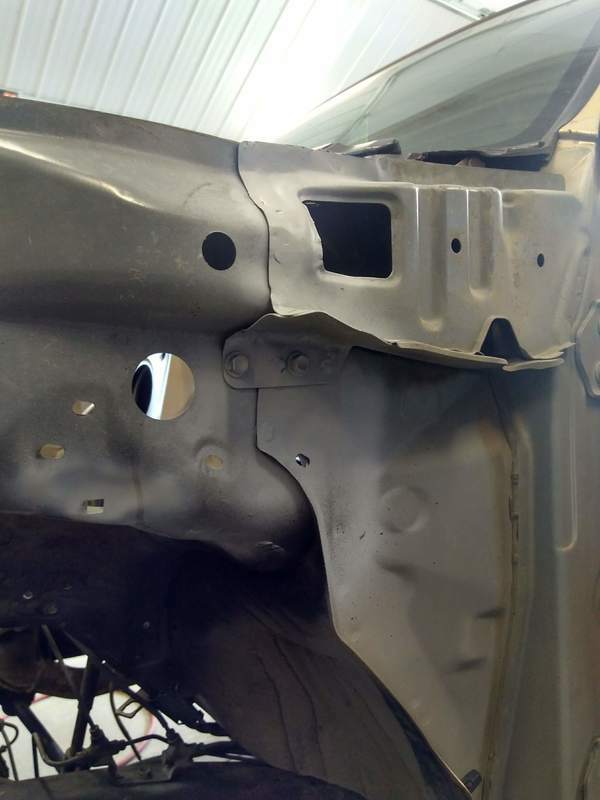 Though for body work having a better quality MIG around will still be nice. 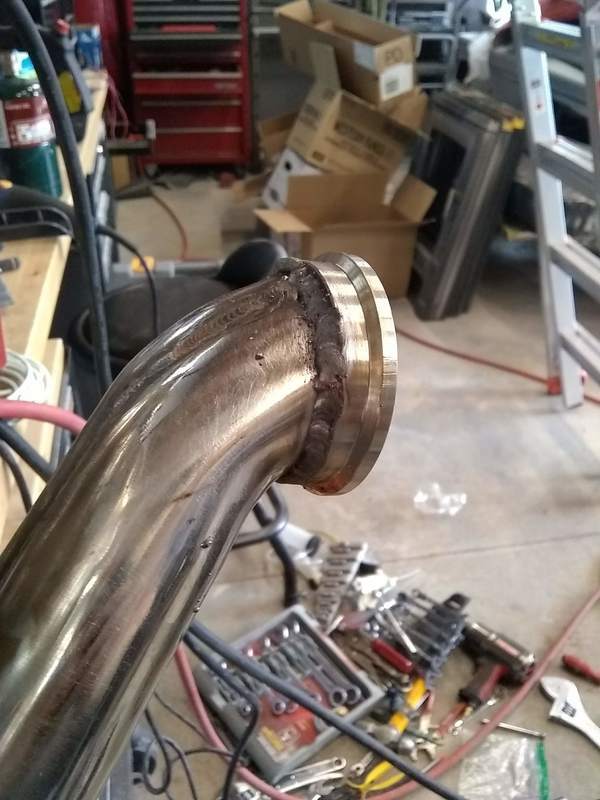 The last thing I TIG welded was the flex section on the pictured downpipe, back in early 2007! Turbo set up is looking good. 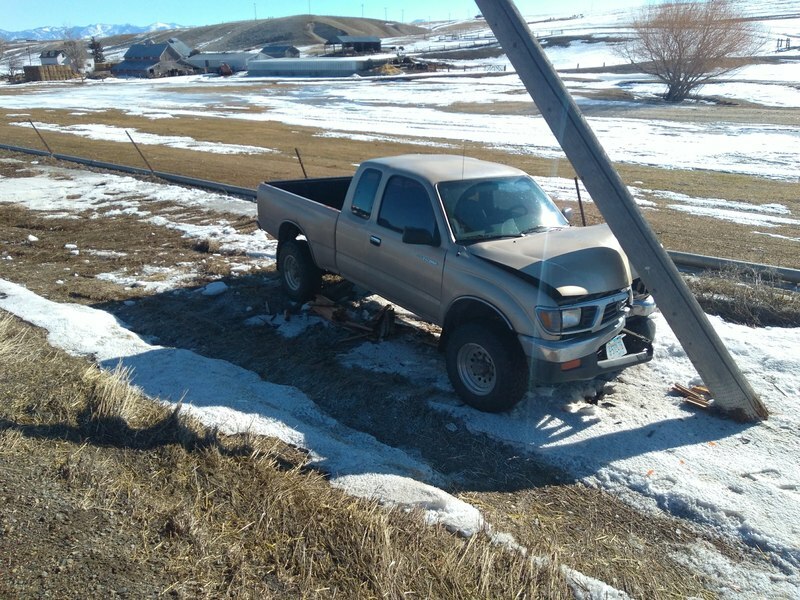 Back in March, I hit a patch of black ice which sent me sliding sideways off the highway and into a power pole. I am thankful that I kept the shiny side up and walked away without a scratch. The pole didn't really slow me down much, I'm glad it was an older one and not a fresh one. It sheared off pretty readily, stopping me no faster than I could have with the brakes on dry pavement. 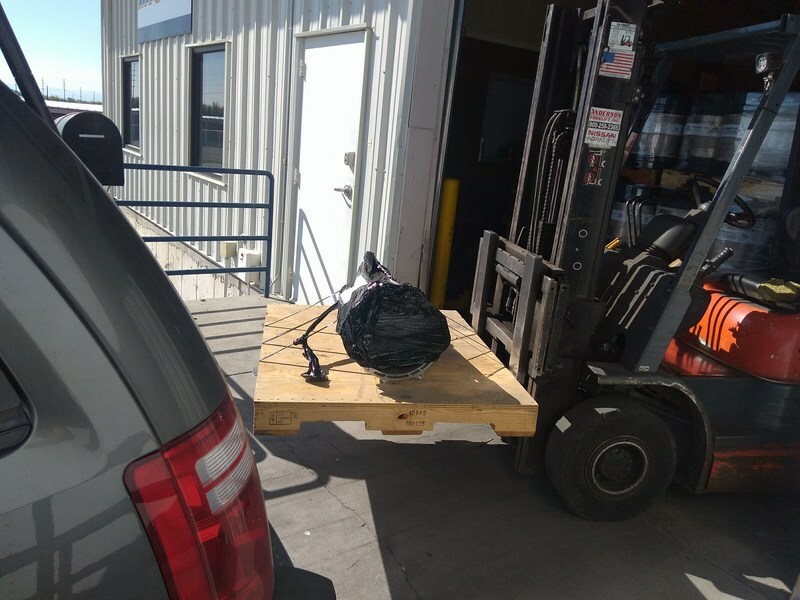 The airbag did not deploy. There are no forward crash sensors on this generation, only an internal one to the SRS module under the dash. Here's a closer view of the damage. I only have liability on this one so I'm fixing it myself. 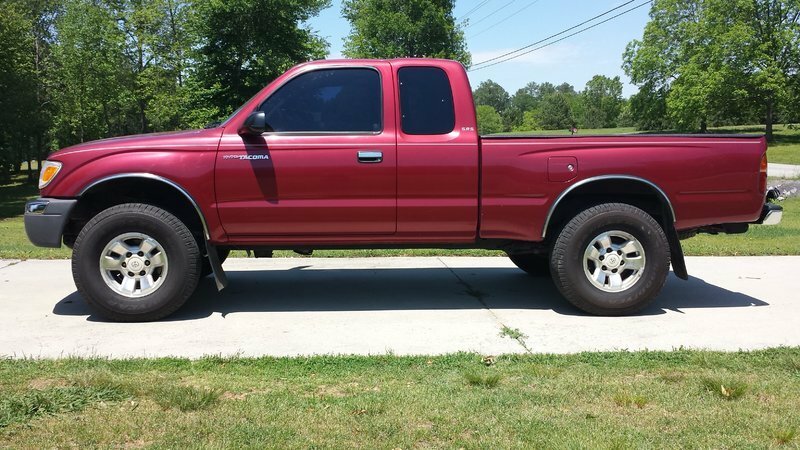 The truck is a 1995 with 320K on the clock. Still runs strong. It's still not worth scrapping - it's a Toyota, there's lots of life left! Replacing it would be $6K or more in this local market. I wouldn't mind finding a younger example of the same generation but those fetch a nice premium. After removing some more parts. Needs a new radiator, fan, condenser, fuse box, driver fender apron, bumper, and front clip metal. 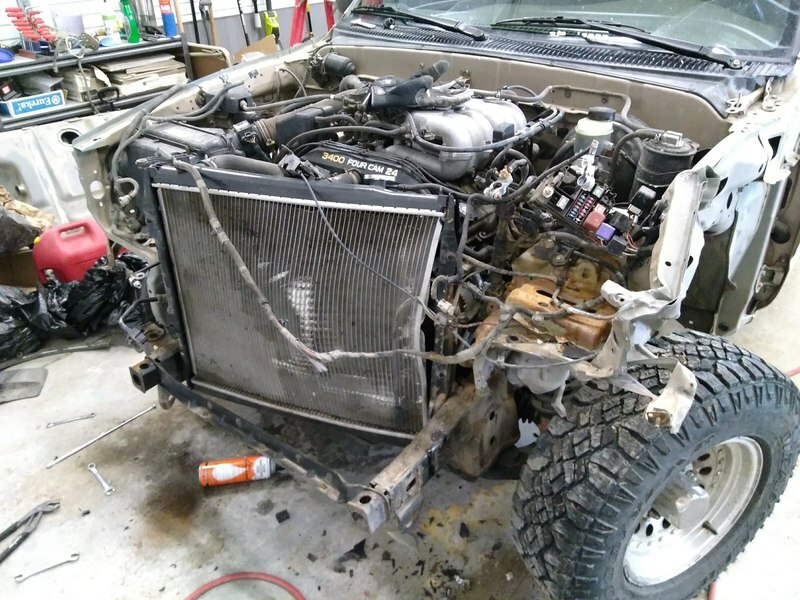 Salvage yard apron and aftermarket radiator support test-fit. 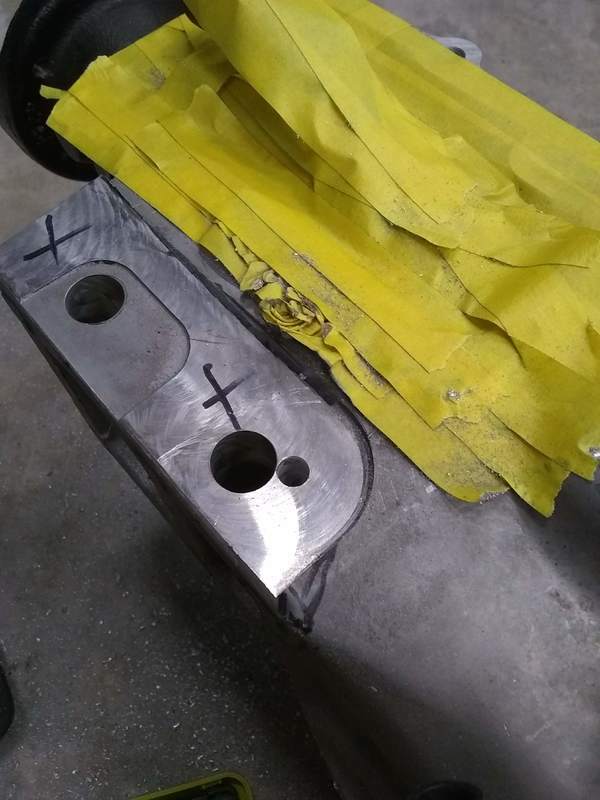 Notice the alignment vs the frame rails. I thought at first the frame was straight up until this point. 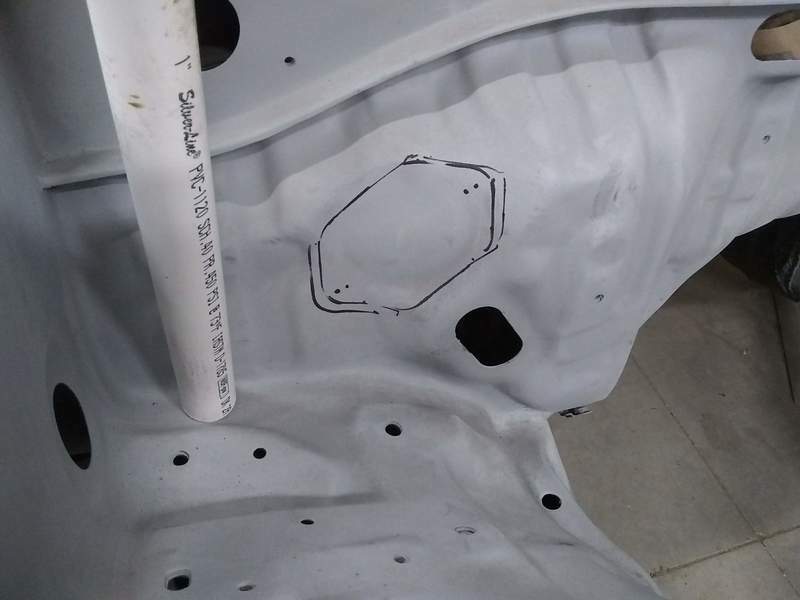 Clearly I was wrong, so I took it to a body shop to have them take care of that part as my only frame tool is BFH . 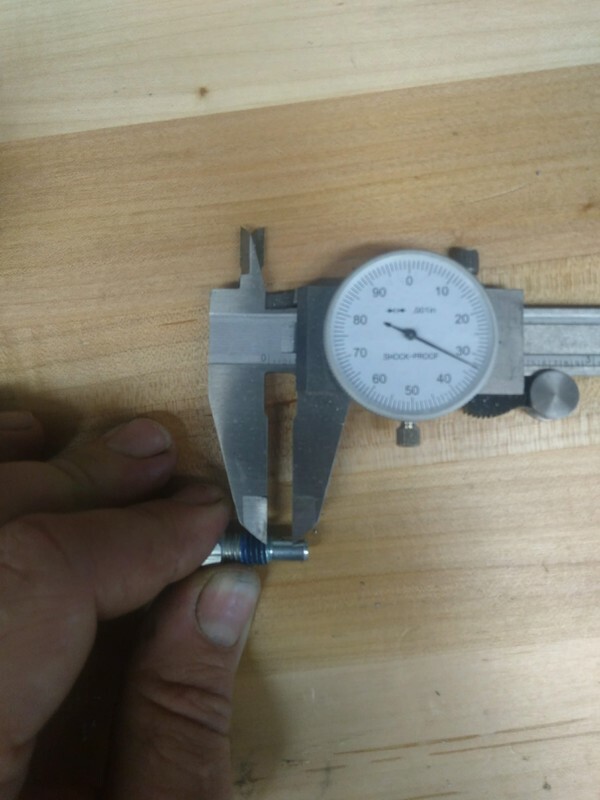 The driver frame horn was 15mm out of alignment in the front, pushed inward. The cab was tweaked on the mounts as well, making the frame look seem worse than it actually was. 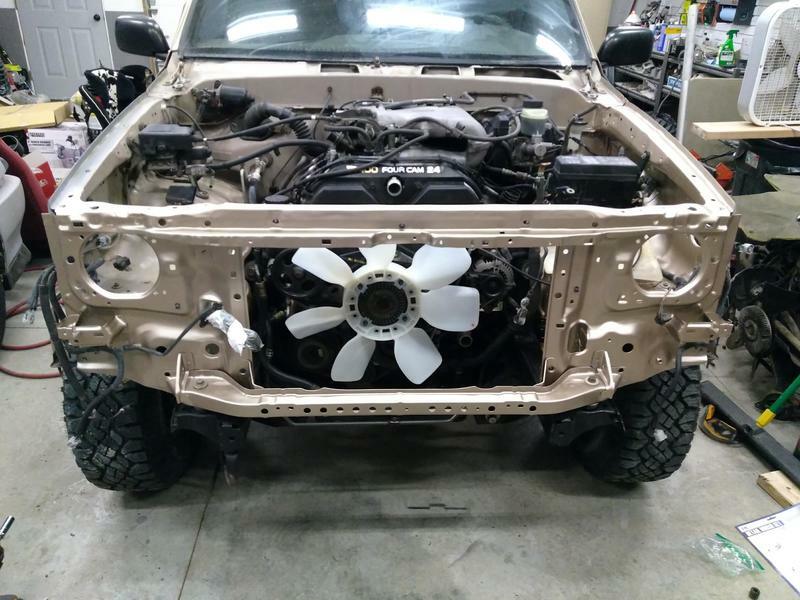 The body shop owner was commenting on how tough Toyota frames are compared to any other trucks that he works on. Now if only they could make them so they don't rust through. Back from the frame rack. Grinding off what was left of the core support mount. New toy in action. I haven't tried any thin-gauge sheet metal yet, which is where my cheapo welder really struggled. I will say I really like the adjustability, it sure beats the "4 settings and always wrong" of the DUAL-MIG 151. Today I pulled the drivetrain. Figured I might as well since I have the access right now with the radiator support off. 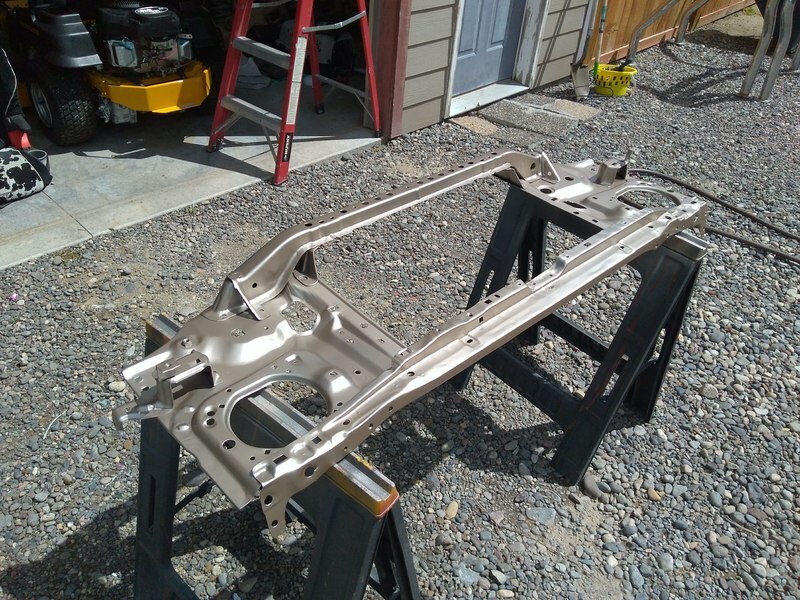 Here's the front end after some pressure washing and touch-up of the frame horns with Rust Reformer. Still have more touch-up to do. 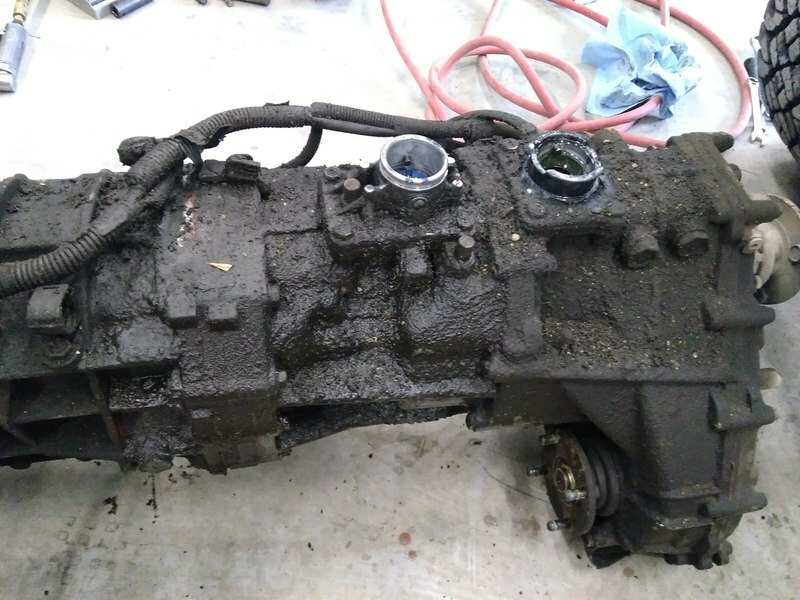 It was pretty nasty - but now I know what the rack and diff look like, they're no longer one single amorphous blob of black nastyness. Here's why I pulled the drivetrain. Yikes. Looks like a number of years with a leaky shifter housing. They seem to be a pain point on these - but nothing some FIPG can't fix. I ran out of time today, but this will be the next victim of the pressure washer. 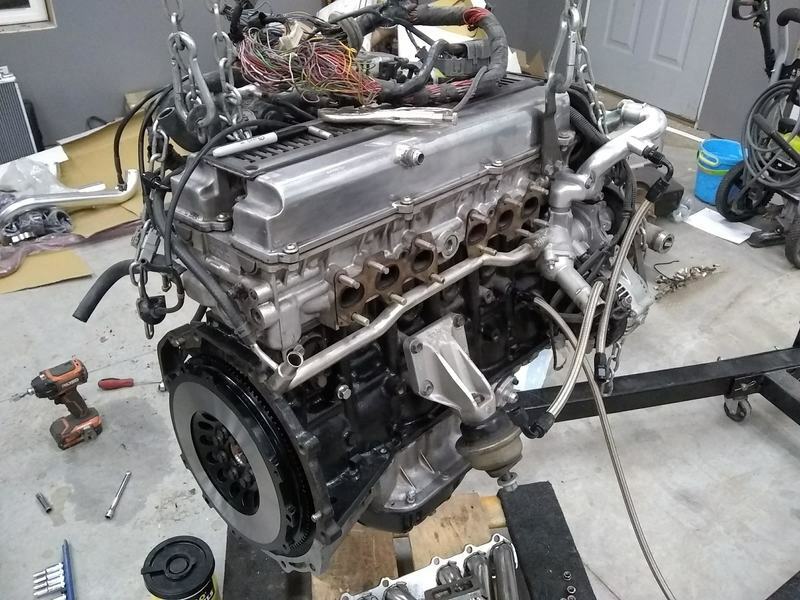 The engine is a little bit better than the trans, but I will be doing VCG's, timing belt, water pump, spark plugs, re-seal the oil pan as well as a general "external" overhaul - not going to dig into the internals. It still runs like a top other than some smoke on cold start but for now will just leave well-enough alone internally. 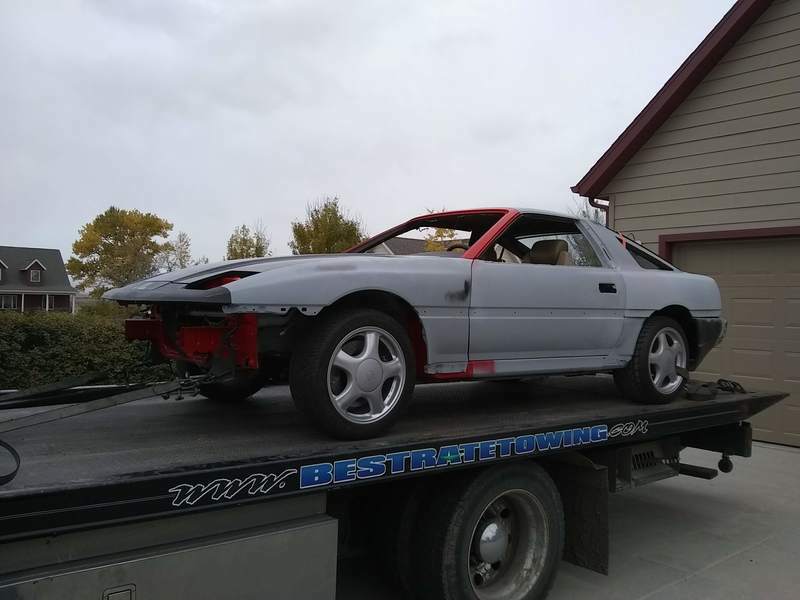 I am contemplating painting it Sunfire Red Pearl, which I prefer (random pic from the web below for example), but that's more work of course. 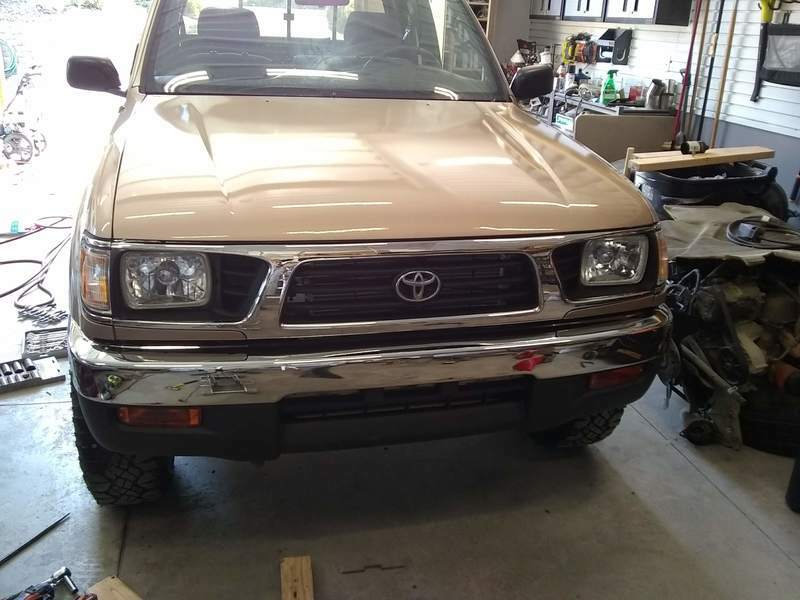 I could get away with just painting the front clip and blending to the doors if I keep the Sierra Beige Metallic color. But then again I do have severe oxidation on the roof, a deep scratch behind the driver door, and wheel-arch rust on the bed so there's certainly the "since I was painting anyway..." temptation to just do a full respray. I don't think the tan color is bad per se, but I do so drool over the red. After a game of Klotski yesterday, I got the drivetrain pressure washed. The engine hoist was in the shop behind the Tacoma, which was behind the trailer, which was behind the Expedition. 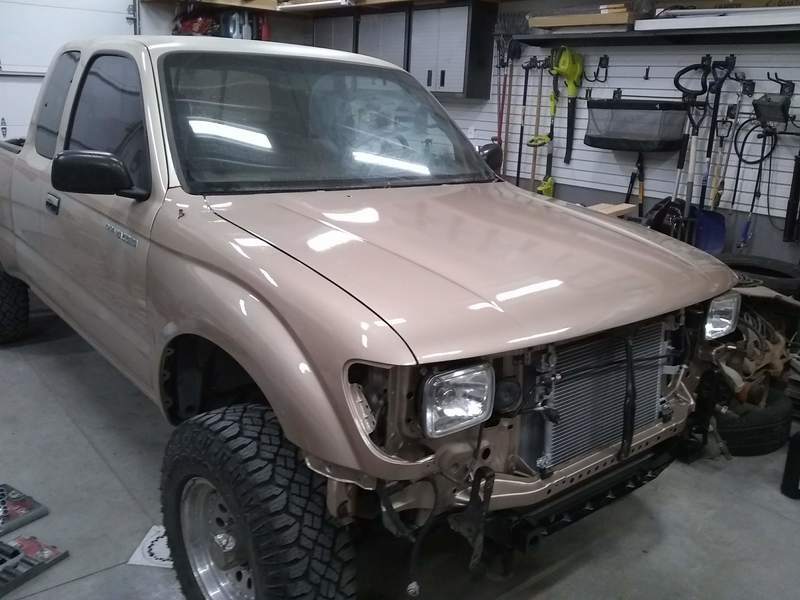 Moved the trailer, pulled out the Tacoma with the Expedition, pushed it beside the shop, hitched the trailer back up, backed it into the shop, put the drivetrain on it, pulled it out, washed it, got covered in grime in the process. Took a shower, changed clothes, had dinner, and "assembly is reverse of removal". That's much better, at least. Some of it seems to be tar, or at least reduced to tar. Will have to clean that up chemically. 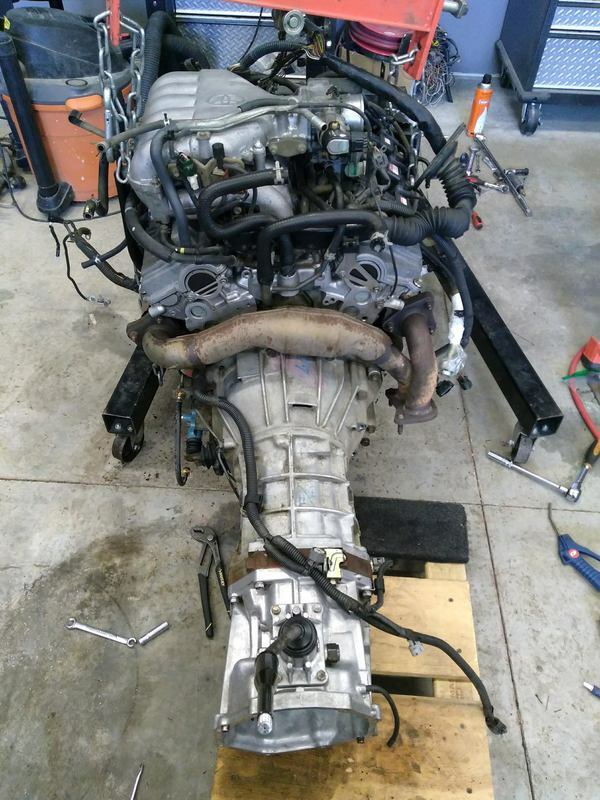 Not much progress on the Tacoma front, but I did pick up the transmission for the Supra. 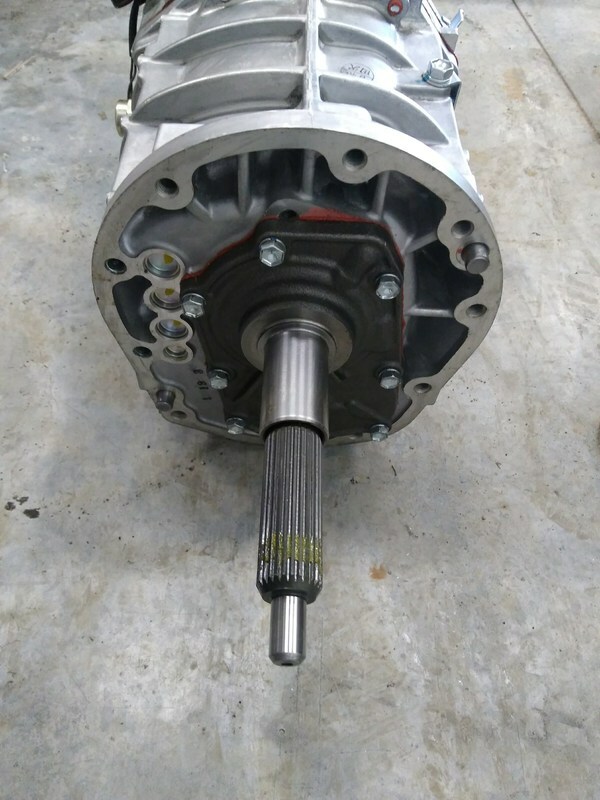 Installed the Toyota "R" bearing retainer and trimmed the input shaft by 1/4". I've found mixed information as to what actually needs to come off, anywhere from none to 5/8", but Driftmotion says 1/4" and I trust them so that's how much I took off. I used a 4 1/2" cutoff wheel then cleaned up and chamfered with a flap disc while rotating the shaft.. 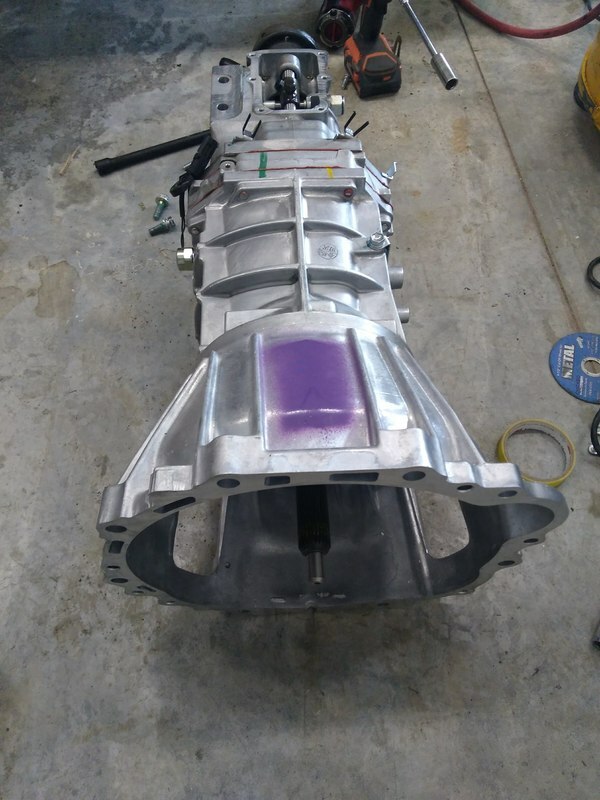 The signature purple 1JZ bellhousing is installed. Notice I got the "WITH INTERIM DESIGN" transmission - I wanted to be the guinea pig for getting proper mounts set up for this version. Reason being, there are far more of this type available - they only made the early lower-mount style for one year (2006-early 2007) but this style was produced mid-2007 through 2010. My thought is that I will fabricate a bracket that transitions this mounting to the stock R154 mount location. Then you can use R154 mounts on any car that is already configured for one. My main concern is tunnel fitment, at least for the top corner of the mounting "block" on the side. Found this inside the tail housing. I always find things like this to be amusing. It also happens to be my dad's birthday. Got the tail housing re-installed with the MK3 R154 shift arm. Front holes, pretty far off. Though it looks like it might bolt up, looks can be deceiving. Basically this leaves three potential options, in ascending order of cost and professionalism. Skip the gasket and donuts. The gasket fouls on the vent shroud for the tripod shifter anyhow. Notch the front holes. Use some Right Stuff to seal it up and some fender washers on the bolts. 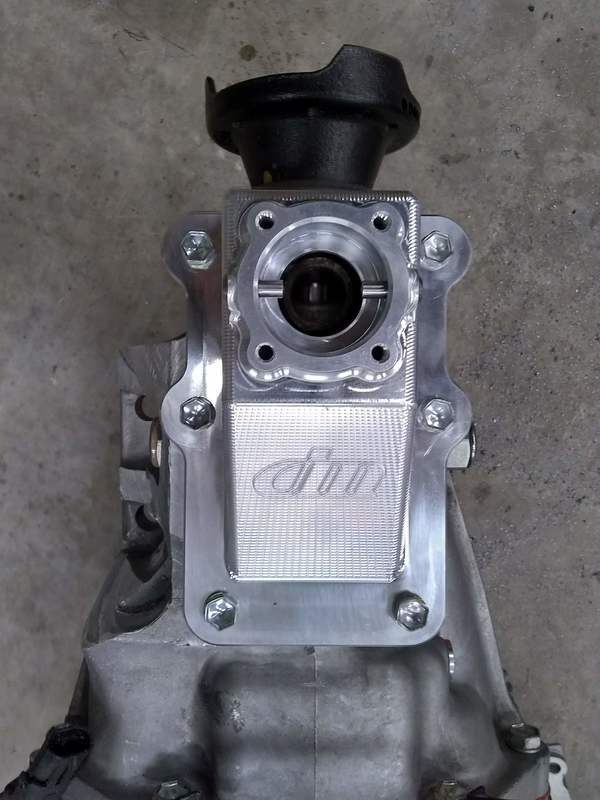 Cut and weld the AR5 base plate to the R154 shifter cup like limequat did. 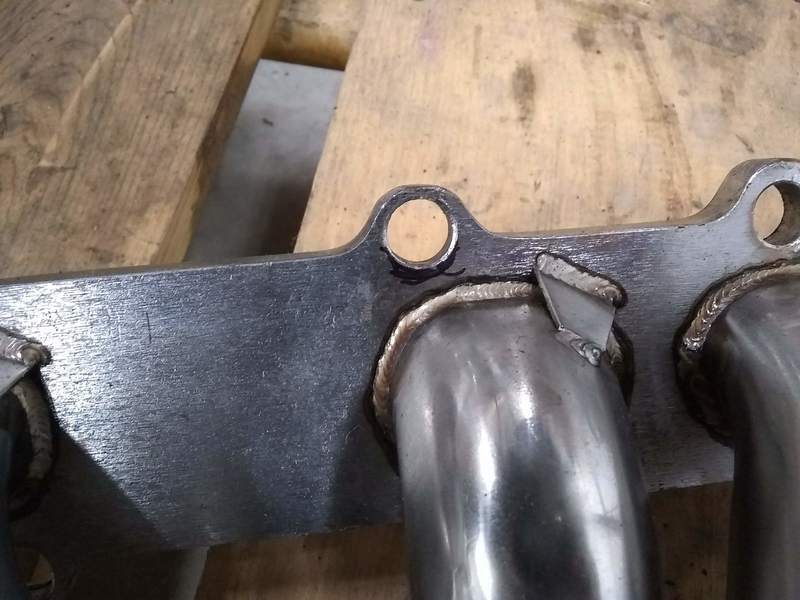 This would require locating someone to do the welding. Possibly the new billet Driftmotion "un-tripod-er" will fit. Waiting to hear back on that. 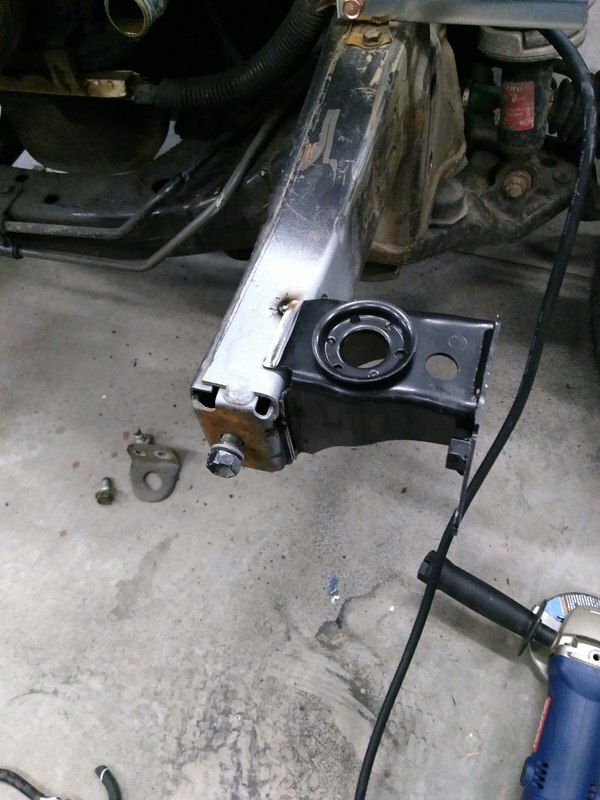 Now that the RTV is cured on the tail housing, I set it upright and tried setting up the shifter. 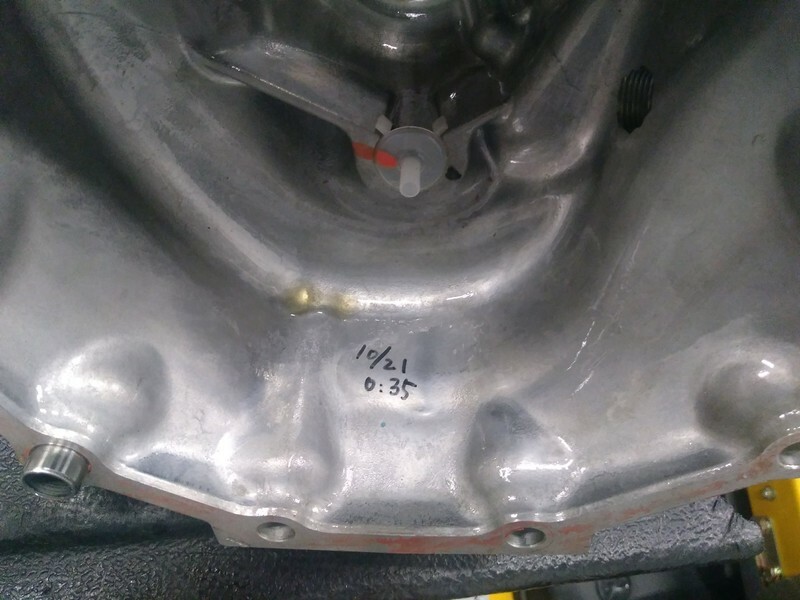 Not only does the R154 rear housing not bolt up, it is about 5/16" too low - it would require a shim. So that complicates option #1, but it should still be feasible by fabricating some sort of shim. According to Driftmotion, their housing (option 3) "should" fit but is not verified. Please try to forgive my ADHD Turbo-Tacoma-Transmission-Injectors-whatever! I'm also trying to piece together a fuel system. I'm getting a bit frustrated with this part, honestly. I had sold the USDM 550cc injectors previously, and haven't found a good set to replace them with. I figured I'd go with some top feeds as there are cheap rails available now. These are 600cc, cleaned, flow-tested and matched. 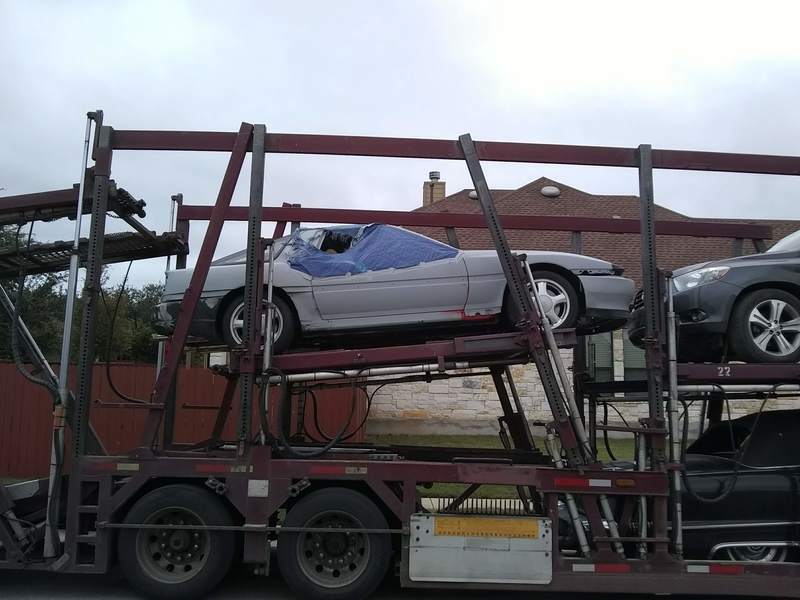 They were being sold as RX7 injectors. The selection for 11mm top feeds (which is what the cheap rails take) was pretty paltry. 14mm are much easier to come by. Anyway, this all seems to bolt up okay with a couple extra washers as spacers to get the height right. However, it sits in the exact spot that the wiring harness does from the factory in the plastic shroud. I've never seen anyone mention that before, maybe because fuel rail change-outs tend to be a high HP thing and they're full custom at that point? I don't want to have to spend too much time fiddling with my harness trying to get everything to fit or re-routing wires so I am keeping an eye out for USDM 550cc still. I'm not going to be out of side-feed HP range so that may still be the best bet. Found some 550cc USDM injectors - waiting on those. 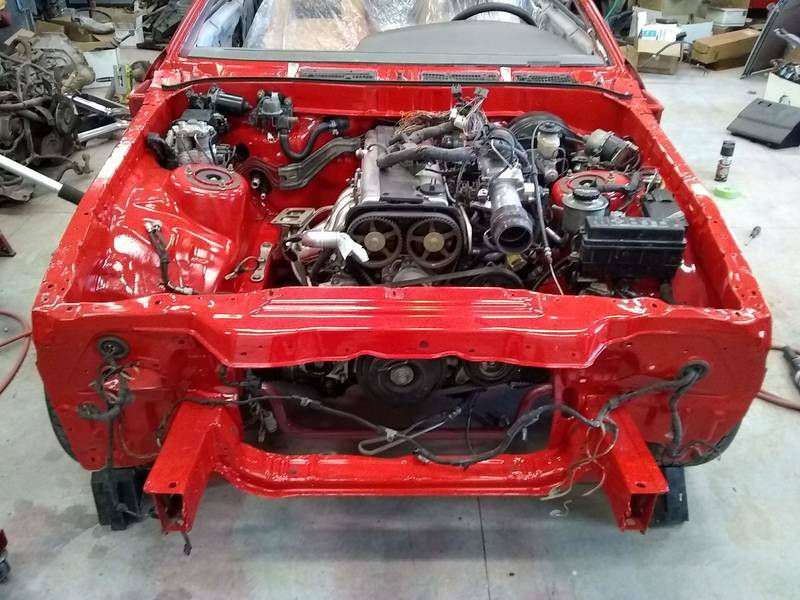 If anyone wants an 11mm top feed 1JZ rail or cleaned and flow matched 600cc injectors (will also fit 7M), they will be for sale soon. 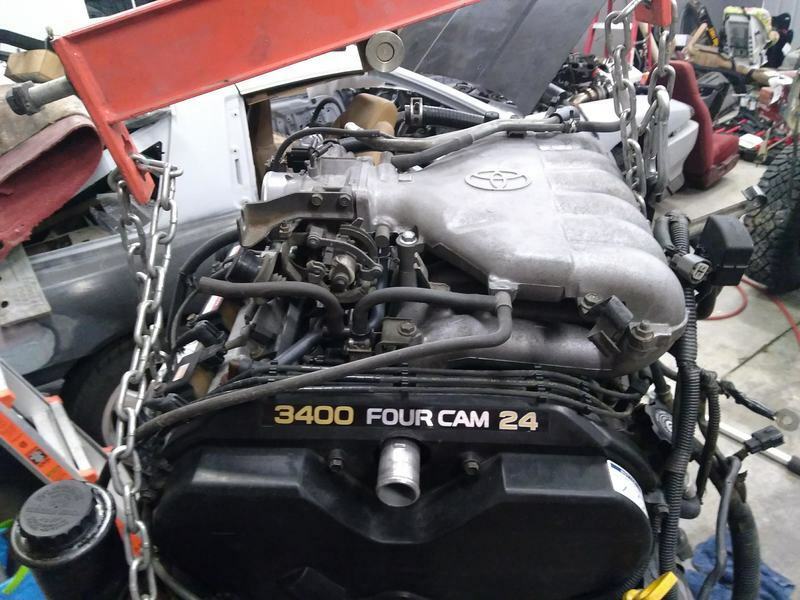 I already had a set of 4 1NZ coils left over from another project - last year I bought a 2006 Prius with a thrown rod for $500 and threw a $500 salvage engine in it. 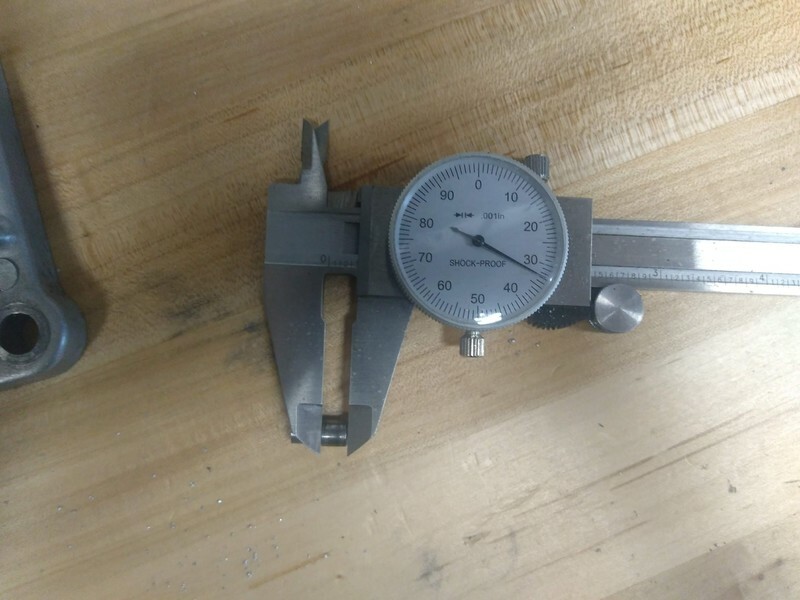 I thought about making my own bracket, as already I have the needed 1/4" aluminum stock - however it just isn't worth using the limited time I have to re-invent the wheel. Back in college, sure. Total cost of about $160 and I won't have to worry about cracked, aging coils anymore (just everything else plastic under the hood ). The 1NZ/1ZZ coils are known to be good performers and are available at any parts store or salvage yard for a song and a dance unlike the JZ coils. I was having to regularly top off the coolant as well as noticing a coolant smell on cold start. 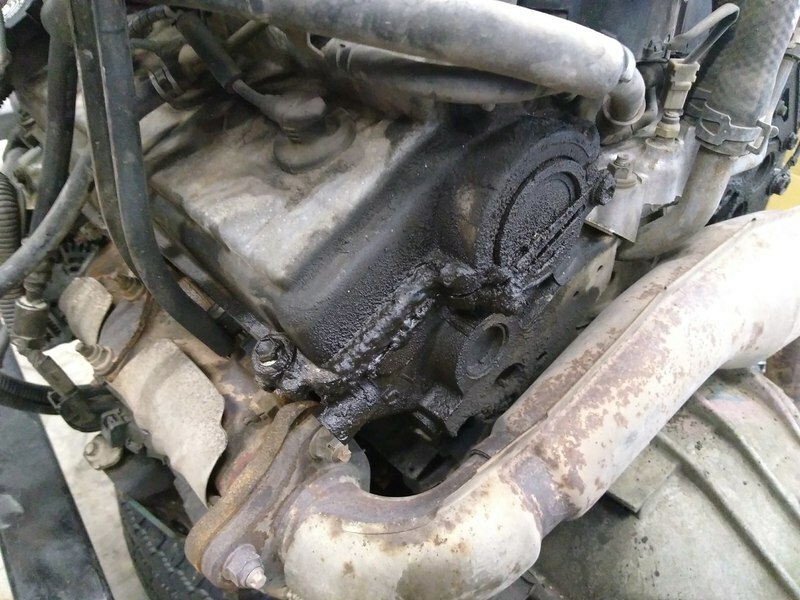 No BHG symptoms and this was the suspected issue after reading up on the Tacoma forums. 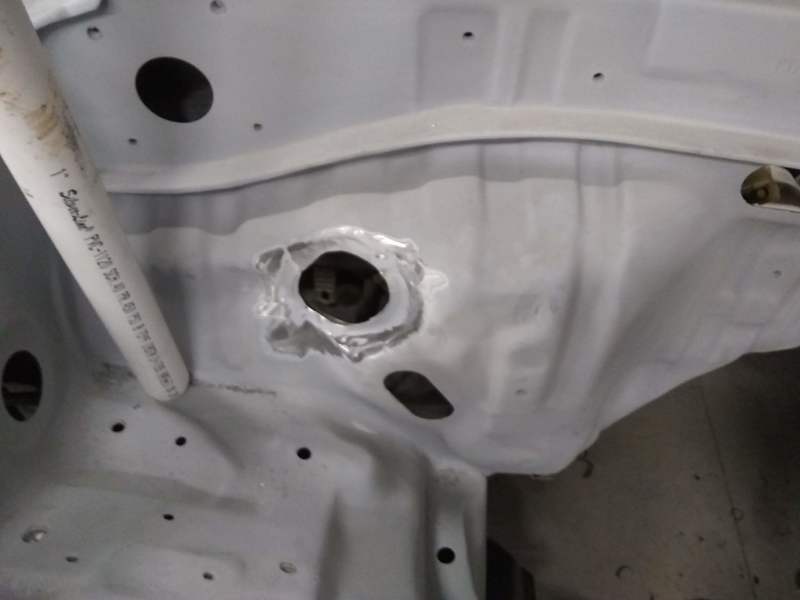 Sure enough, the head surface had significant pitting on the coolant passage gasket surfaces. I wire wheeled them and filled with JB-weld, then used the Right Stuff on both sides of the gasket. I also replaced the knock sensor pigtail while I was in there. ...and the pilot bearing/rear main. 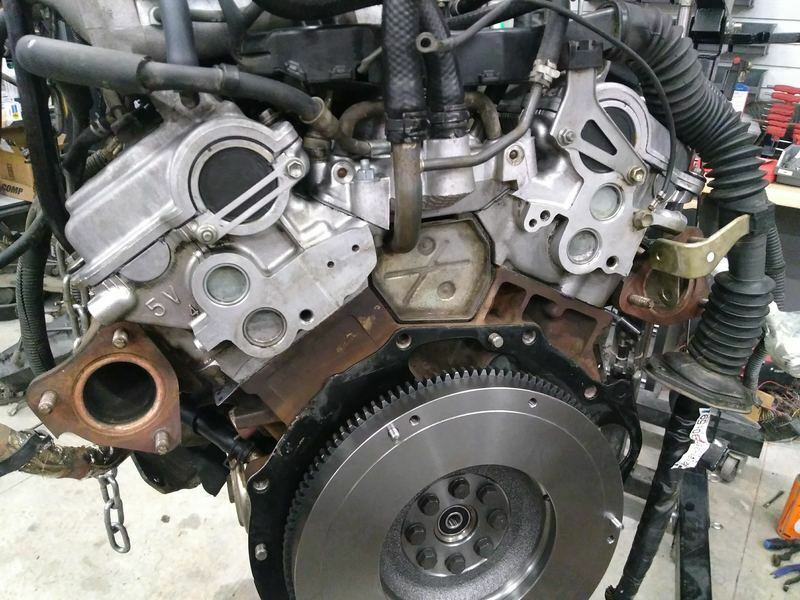 Everything is back together, with new seals, new water pump and timing kit, and a thorough cleaning. 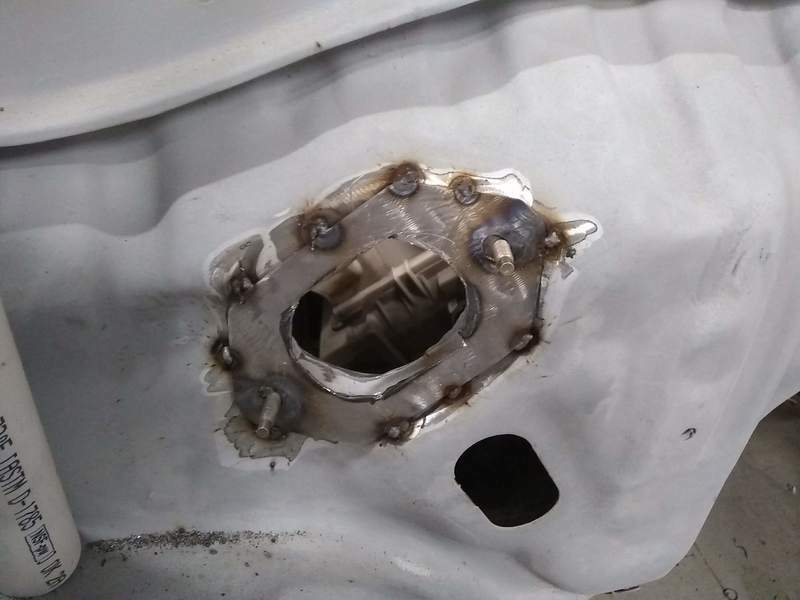 I re-sealed the oil pan and rear main housing as well with the Right Stuff. It had been done poorly with some sort of tan sealer previously, which was hardened and crispy, and not adhered to the block at all. Please excuse my shop mess - cleaning day comes when I can't take it anymore. I like to keep things clean but with limited time it just isn't always a priority. 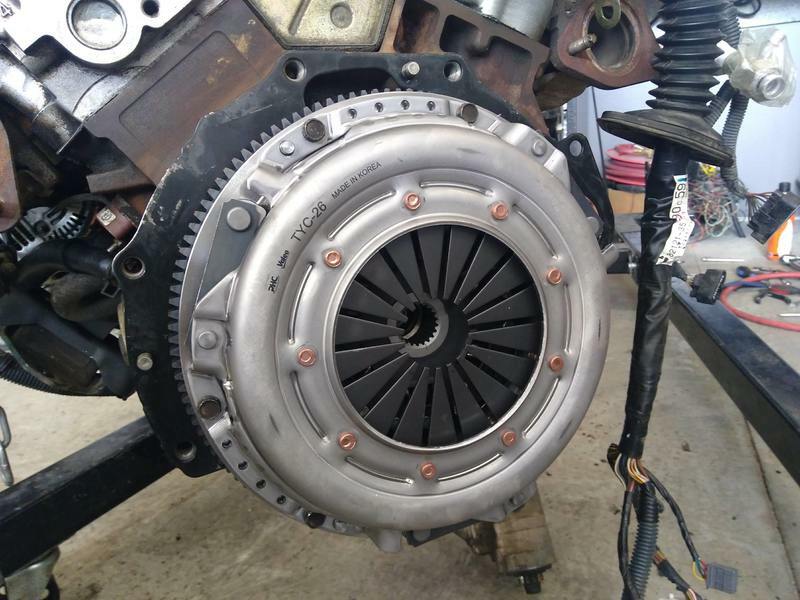 I also bought a cheap clutch kit off eBay. $100 shipped for the whole shebang. 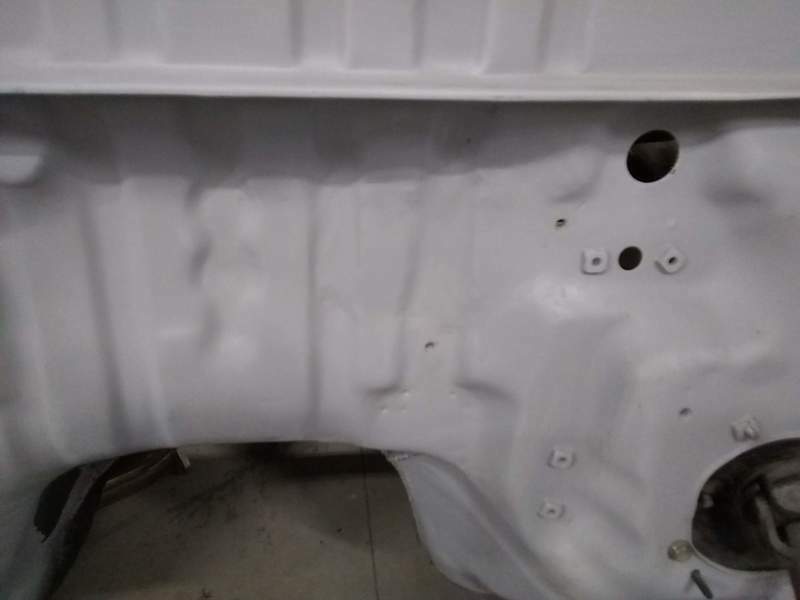 It included a Valeo pressure plate, and the other parts, while unbranded, appear to be excellent quality, especially considering the price. Time will tell, but I don't see anything that concerns me in the least. 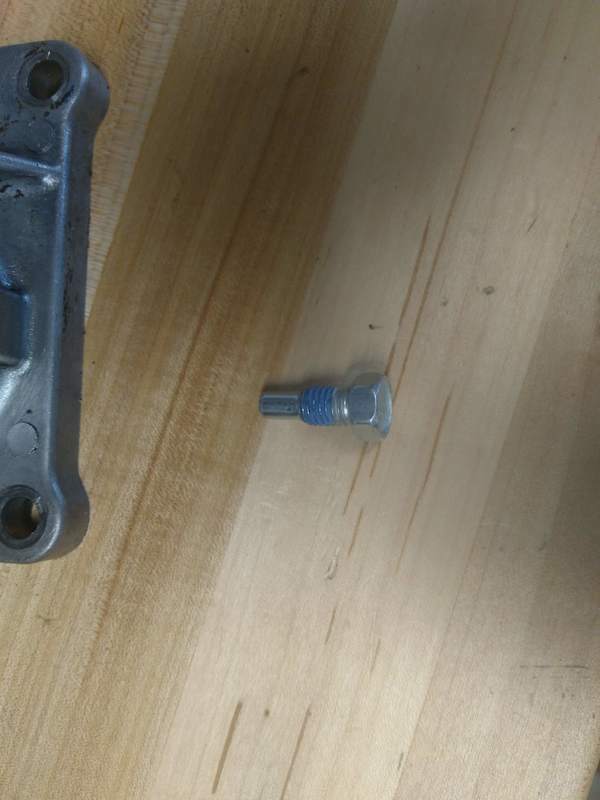 My Suzuki shifter locator bolt came in today - time to go try tapping the shifter housing. Got this in the mail from Singapore. 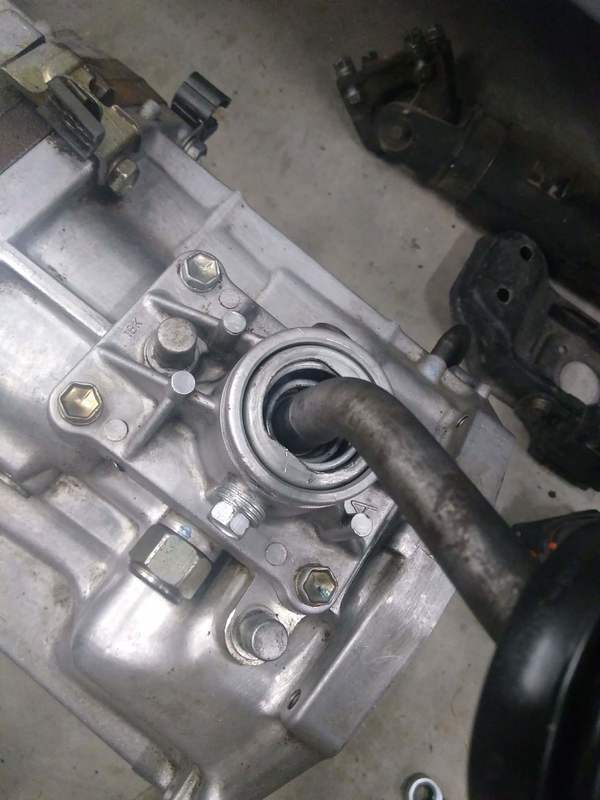 Suzuki Samurai shifter locator bolt. There are two sizes, you want the "long" "early" one with the 6mm pin. The newer one is a flange bolt, shorter with an 8mm pin. 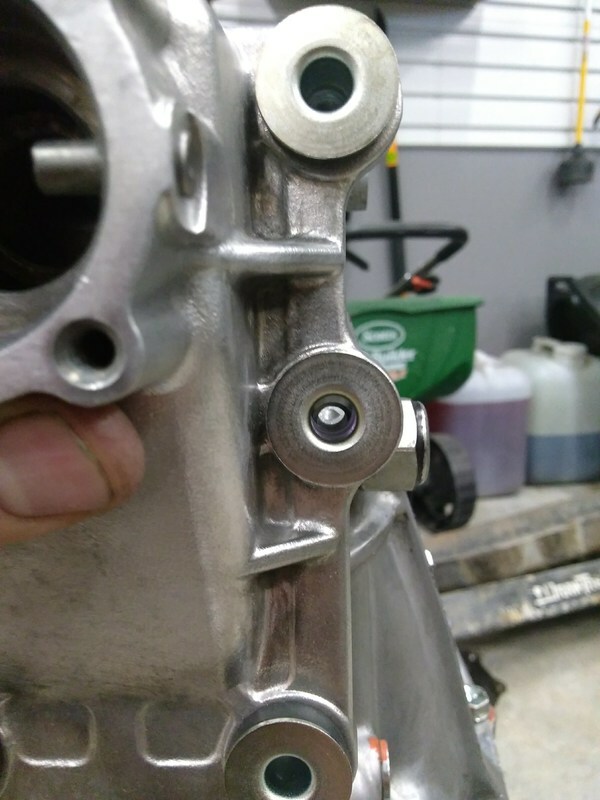 One of the factory locator pins was worn and sloppy in the R150F housing, likely causing or contributing to the gear lube leak from the top of the transmission that made such a mess of it. You can't see it here, but the pin is loose in the housing. Took the head off with a roloc. Put the bolt in the vise and took some off with the roloc. Close enough. It's not a critical dimension. Installed with some washers to set the depth. Shifter fits perfectly. Fixed for $8 vs $70 for a new housing. 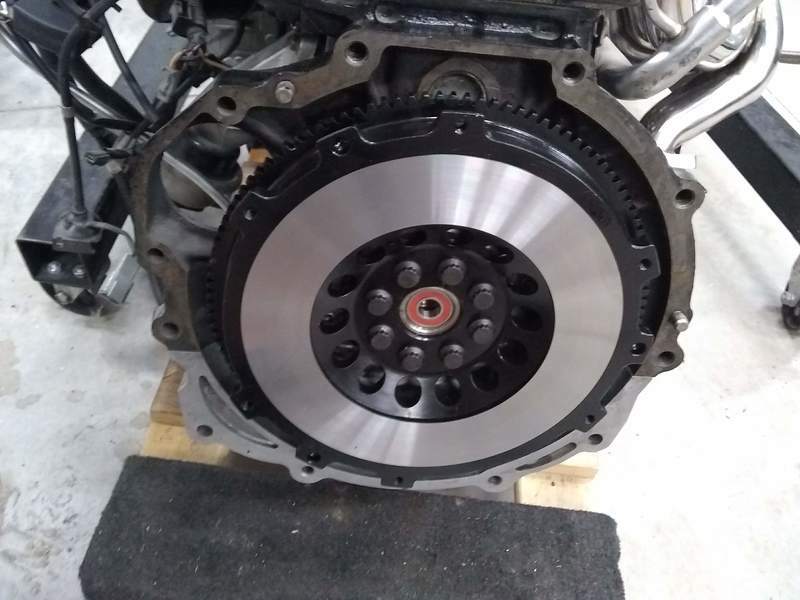 Also got the new clutch installed. Cleaned up the inside of the bellhousing, installed new TOB, clutch slave and soft line. 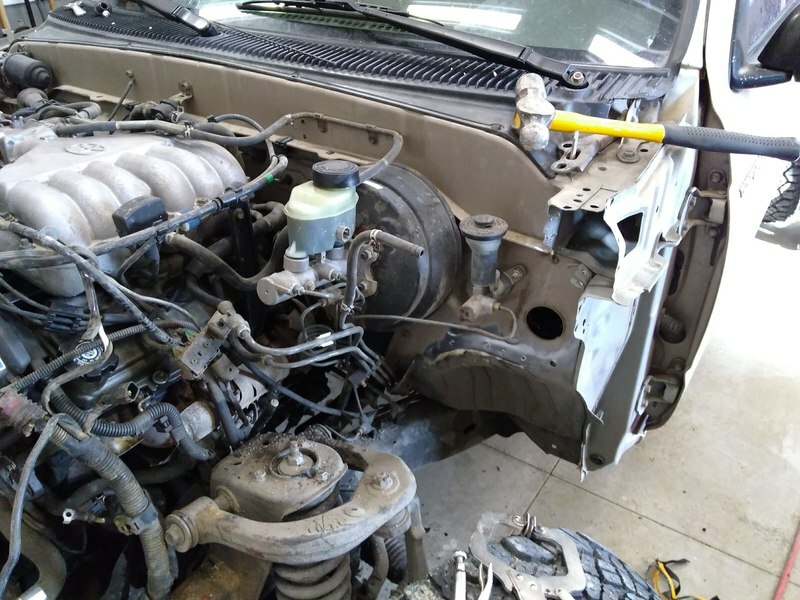 Installed trans to engine and installed crossover pipe with new gaskets. It's ready to drop in. 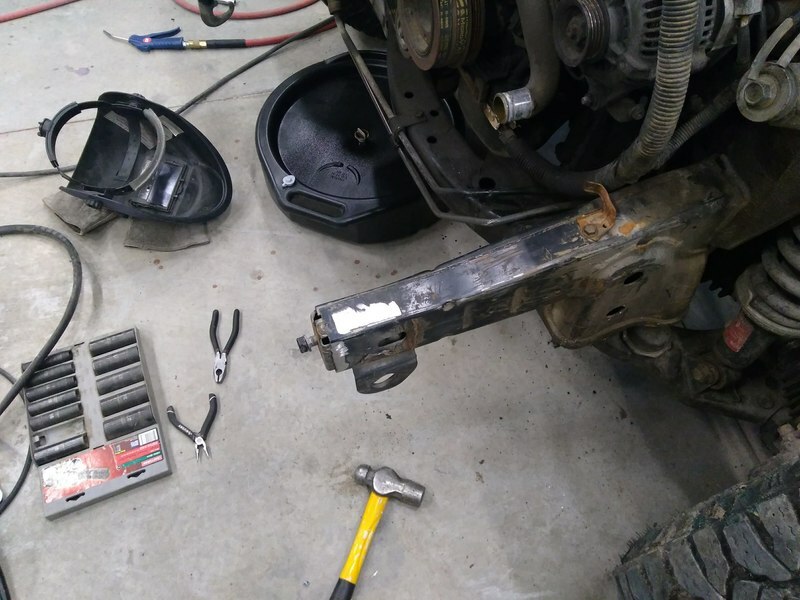 I took advantage of the easy access with the apron off and used the no-spring-compressor method to swap in the new shock for the driver side. I had to pull the old one anyway to straighten the tower slightly as the front face of it was pushed in. 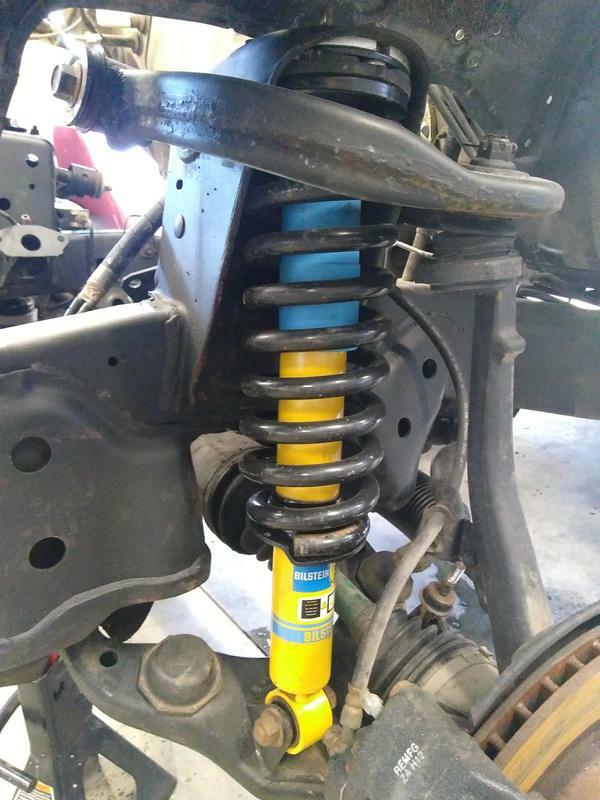 I got a set of nearly-new Bilstein 4100's for free. Can't beat that. Couldn't get the LBJ bolted back up though without the weight of the drivetrain. Once that was back in it bolted right back up. 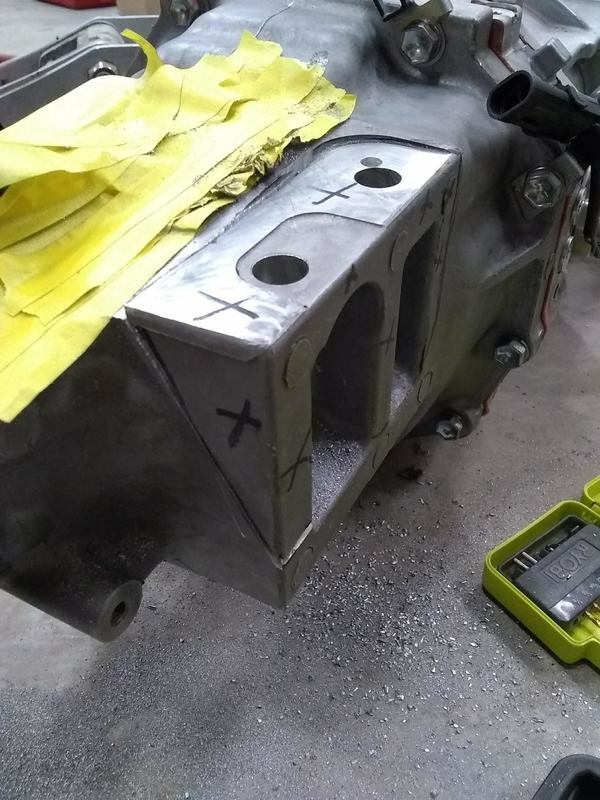 Got the replacement apron welded, seam sealed, and primed. Used weld-thru on the front edge which mates to the radiator support. Welds on the other side. Apron painted. Used the 4M4 basecoat. The OEM color is basically a flatter and non-metallic version. 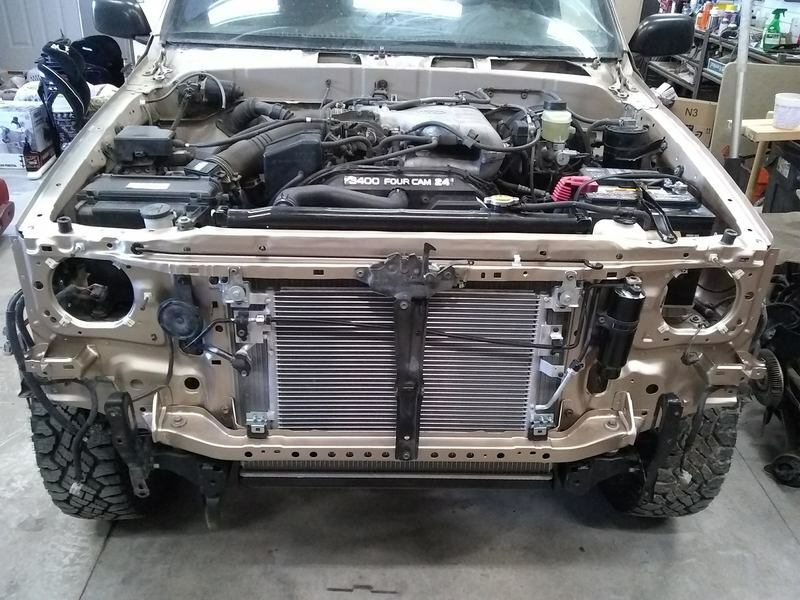 So it's not a perfect match to OEM underhood, but it'll do for this truck. Then I only have to buy paint once for the front clip and apron/core support. Radiator support bolted (bottom) and riveted (top). I used rivets instead of welding along the top and sides of the aprons. I'll plug weld the lower, thicker pieces of the aprons to the radiator support, but didn't feel it was necessary for the rest. 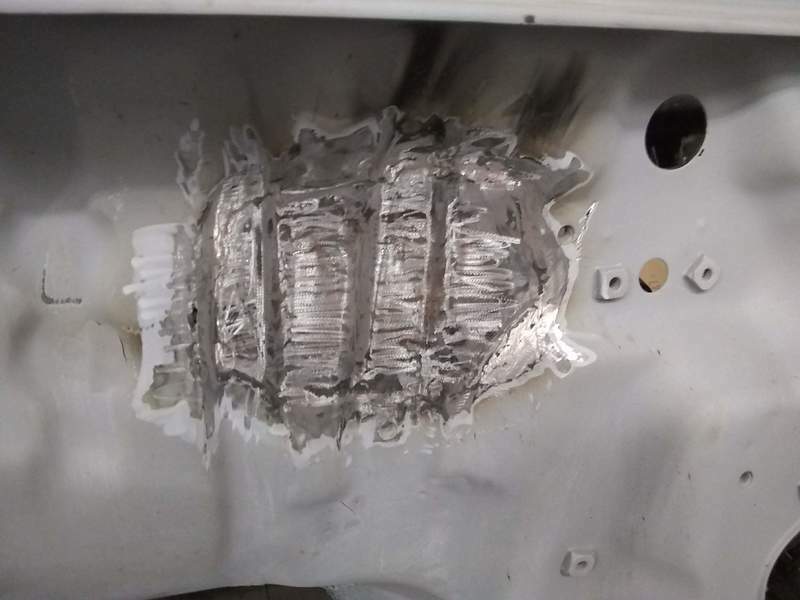 Less welding = less paint touch-up. Shouldn't be too long and I can start directing attention toward the Supra again. On the Supra front, my intercooler pipes came, as did my anti-sway bars and new clutch disc. I ordered it from California Custom Clutch. I ordered it as a 240mm Supra disc with a GM hub. Unfortunately, after being told there would be a 4-6 day lead time, and waiting 24 days for shipment, what they sent seems to be a 232mm S10 sized disc. Ugh . Trying to decide if I should make a fuss or just run it. I'd rather not wait another month for a replacement. Nice paint job on that engine bay. I never heard of that clutch company but I would try to find a few alternative clutch companies to see what is out there in terms of time. I would not hesitate to send that one back if it is the wrong one. 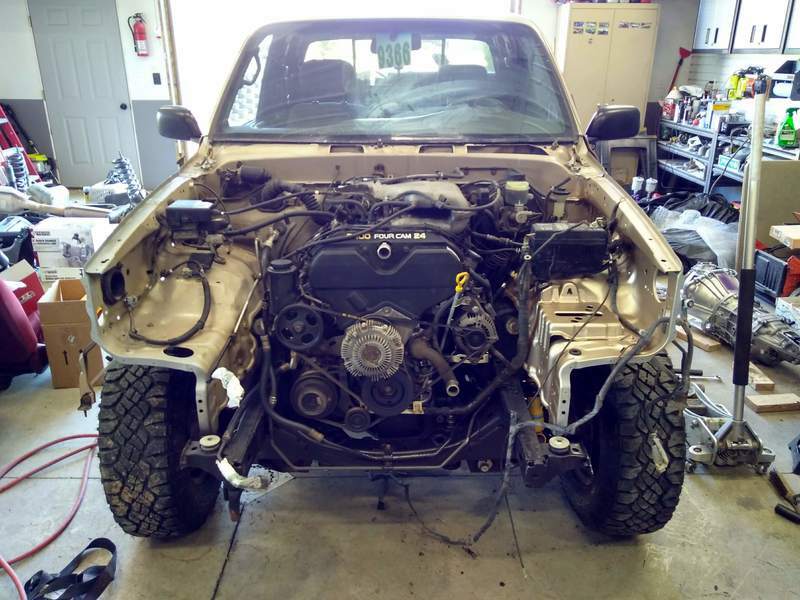 Tacoma is coming along... got the apron lowers welded, finished putting the engine bay bits back together and got fluids in her. I went to bleed the clutch and the MC wasn't functioning. Autopsy revealed a torn seal. I also had a small brake fluid leak, so I ordered new clutch and brake MCs and installed and bled. It turns out the leak was from the brake line between the master and front wheel splitter as it was damaged in the crash. 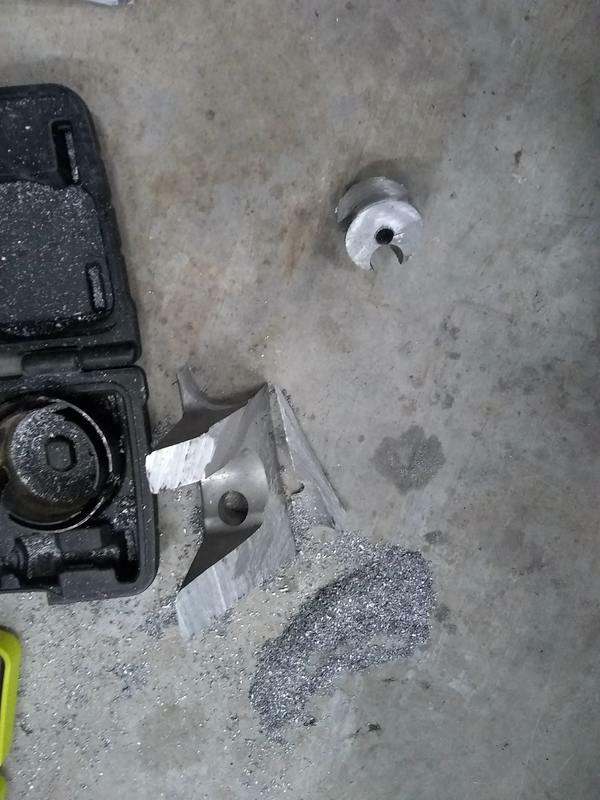 I figured it was good insurance to go ahead and replace the brake master anyway. Still need to charge the AC but other than that it's mechanically complete. Just need to finish the body work now. Not much on the Supra front. 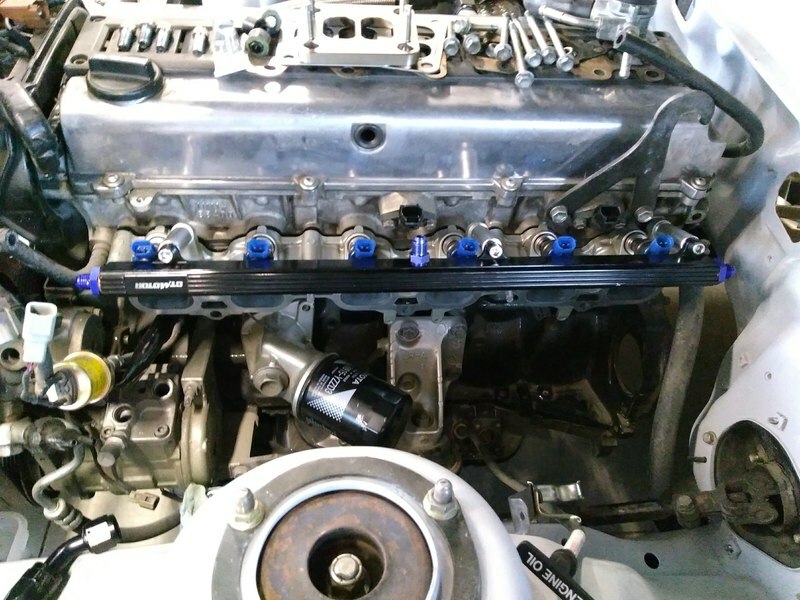 I ordered some front subframe/steering rack bushings from Ronnie K, and got some new O-rings for the side-feed USDM 550cc injectors. 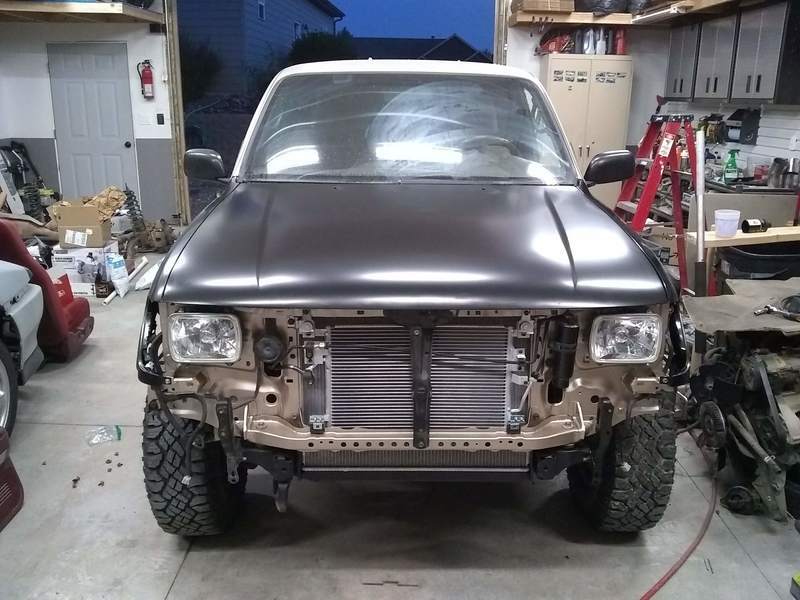 Tacoma hood and fenders fitted. Bought the CAPA certified stuff. They fit pretty well for the most part. I had to drill some missing mounting holes and straighten/fill a couple minor shipping blemishes. Paint! It's not a perfect match to the 23 year old paint, but it does match really well to the unfaded stuff in the door jams I decided not to blend it because a) it's too far off color wise to blend well and b) I don't have time before we move and c) I intend to paint the rest of it anyway. Some time. Took it up to the Little Belt mountains over Labor Day, up over Yogo Peak. Getting ready to move again, trying to button up some Supra stuff so that it's easier to move. Got some Kirker Single Stage Viper Red paint, going to go with that. Engine bay is first. 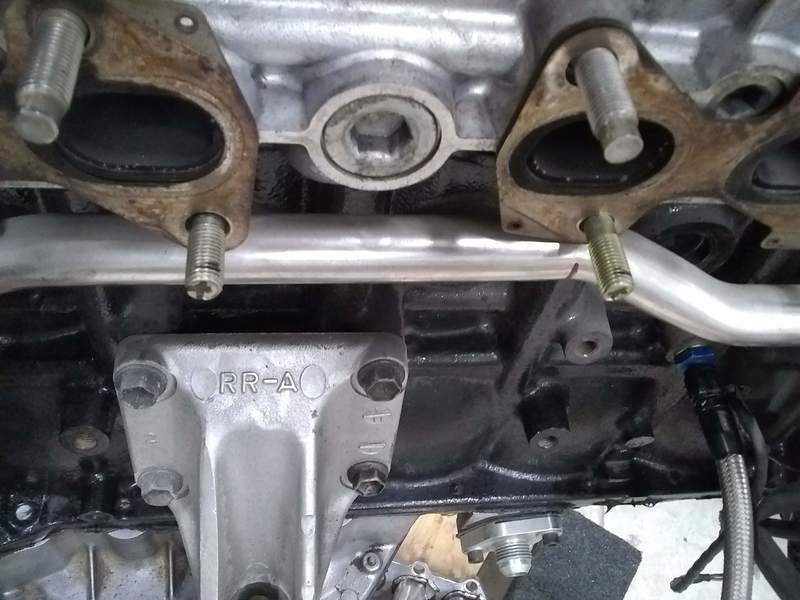 Exhaust studs installed and length checked. I had ordered some 2JZ e-torx ones but they were too long for my liking. The center two bottom studs are still too long despite using the shorter studs. Need to take a bit off. Found the oil feed adapter that I had replaced with a plug and installed it an the line to the front feed port. Cheap manifold strikes again This hole is a good 3mm off. 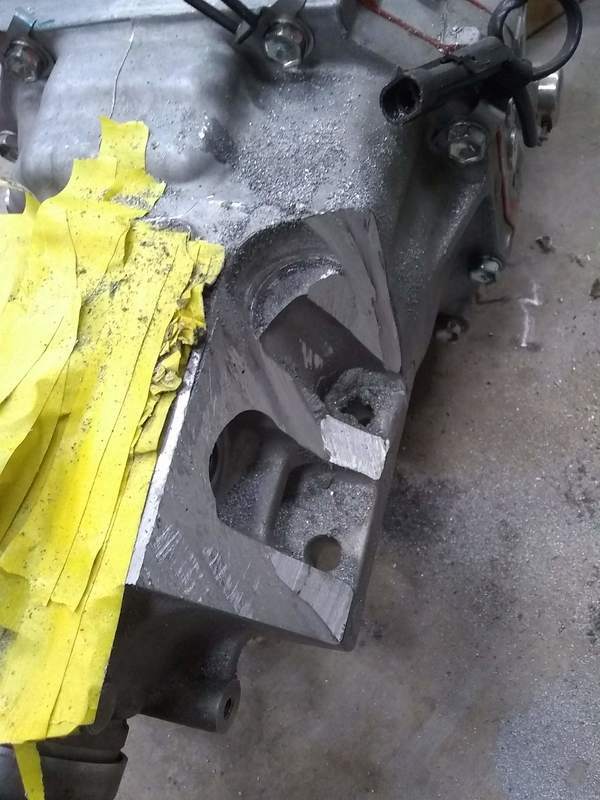 On to the transmission, have some clearance work to do, either that or buy the early tailhousing. Also now that I've tried it out with the harness, I don't really like how the speedo-cable-hole route plays out. It's too close to the engine in the bay and it's too tight behind the HVAC boxes under the dash. So back to the original location it'll go, though I'll be using the MKIV-style grommet. Everything is coming together soo well, good job. 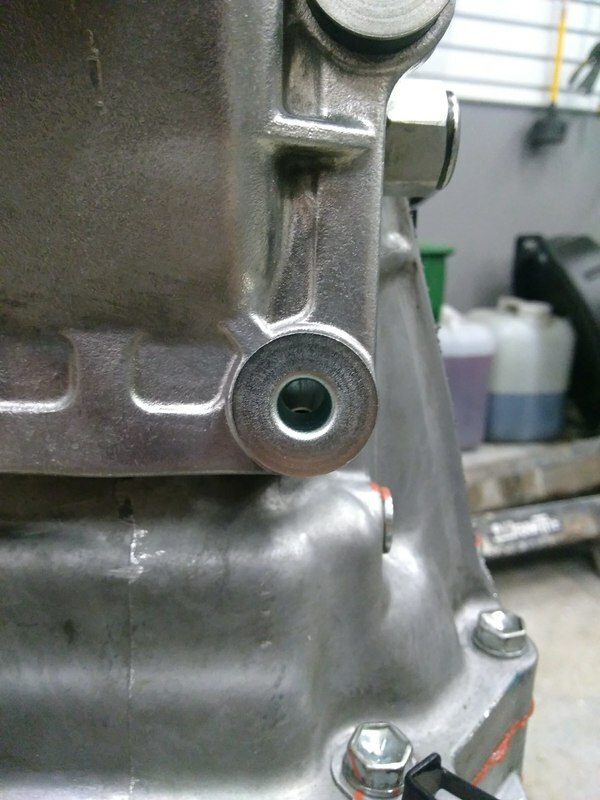 I chopped the rectangle flange off the manifold. Then welded up the 44mm v-band. Gah! Mig spatter. Always need more welding practice. Oh and I didn't have any tri-mix to go with the stainless wire so I just used C25. The weld won't be "as stainless" but will be fine here. Time is of the essence. 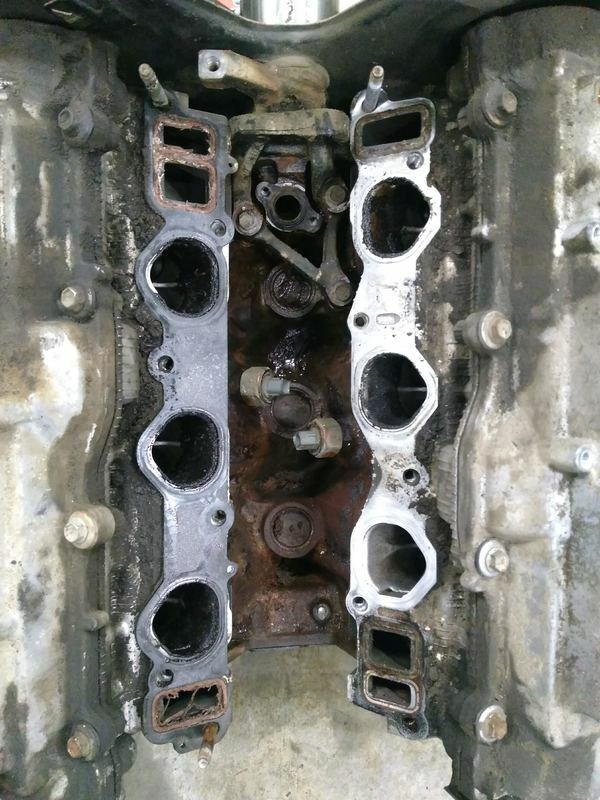 It juuuust clears the engine mount, by about 3/16". Whew. 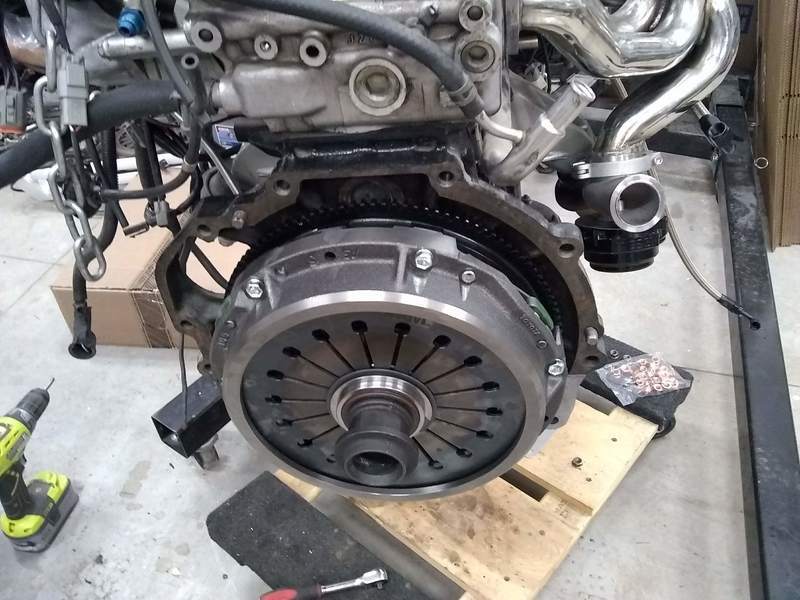 Clutch assembled and installed. 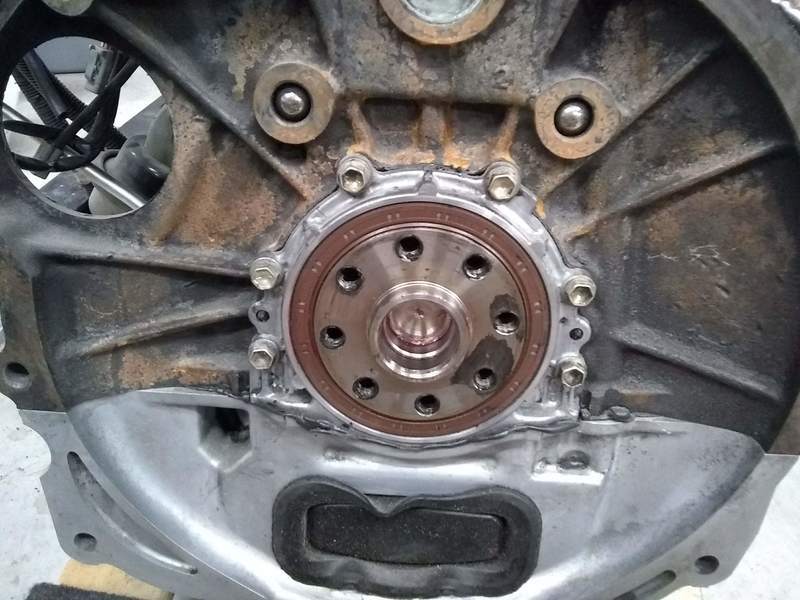 New OEM bearing and pressure plate. 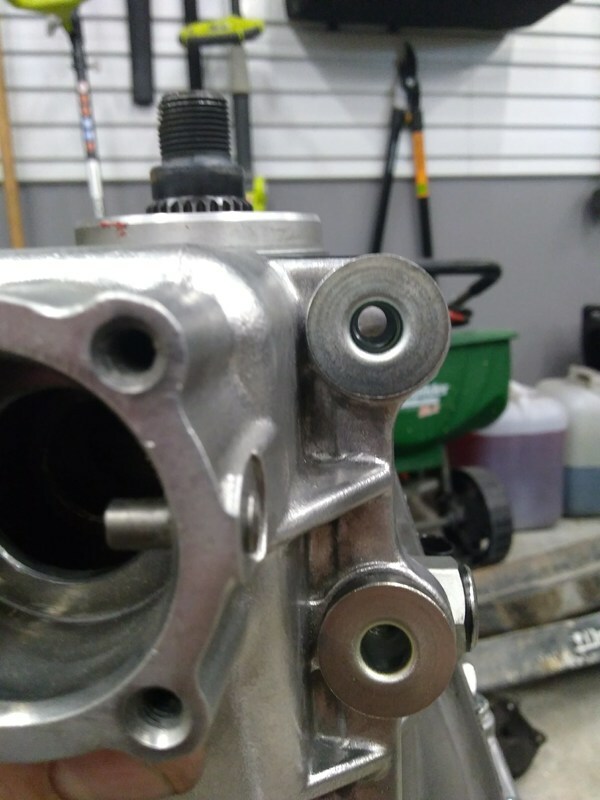 Didn't have an alignment tool for the AR5 input shaft so I eyeballed it. The tool sure makes it easier but I haven't had one I couldn't get together yet after carefully eyeballing. 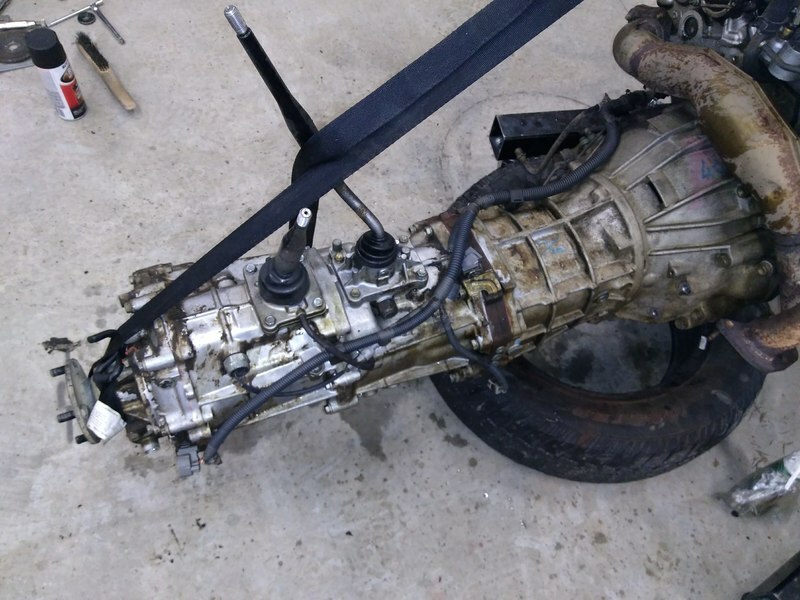 Next; transmission surgeryhackery. It's hard to see but I've cut with a sawzall along the line at about a 30 degree angle, about 3/4 of the way down, to the start of the corner. I've also drilled a pilot for my hole saw. Why? The torque beam mount is too wide for the tunnel at the top. Another view showing the cut. Some DM bling . It fits! A match made in heaven. Except for the 2JZ engine bolts. They were all about 5/16" too long so I cut them down. 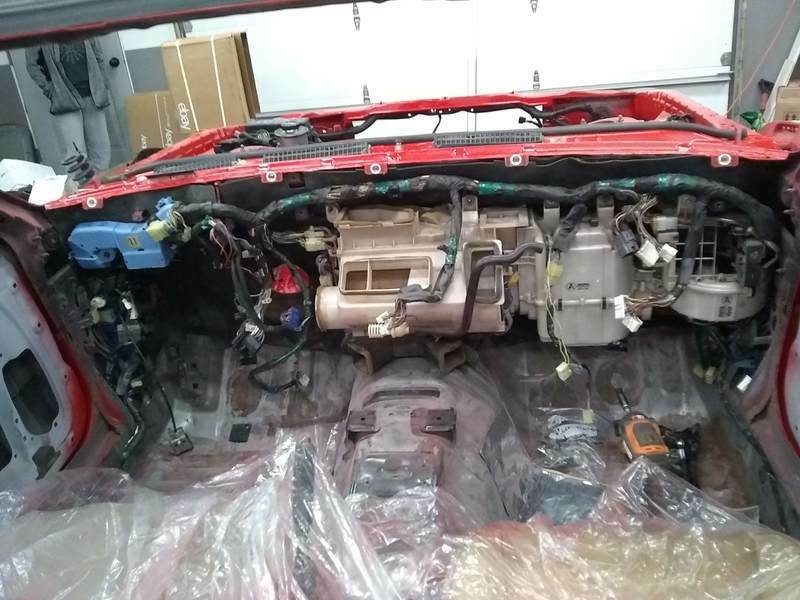 Now for the engine bay. I want to get it painted but have some mods to make first. 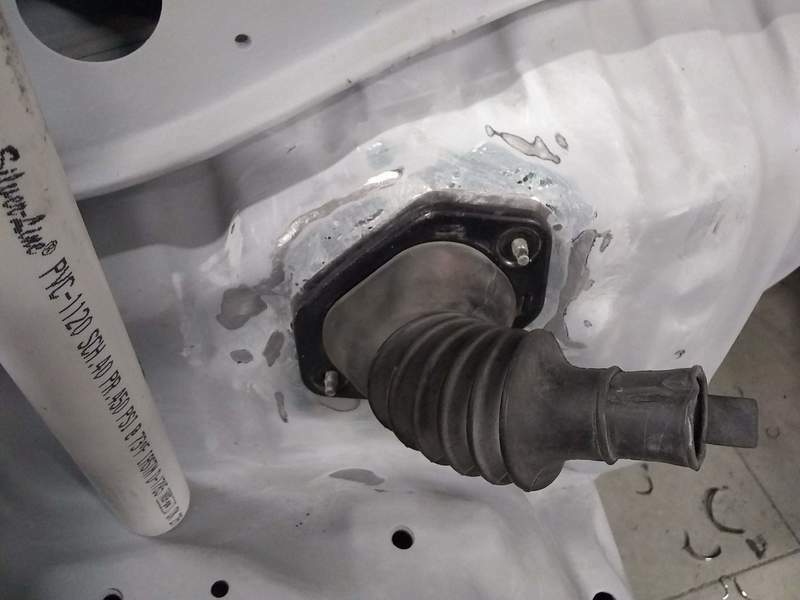 I had re-located the harness hole to where the speedometer cable hole was based on others stating that they had done it for a cleaner harness route. Well, there just isn't room for the harness to fit without de-looming or smashing it behind the HVAC boxes. 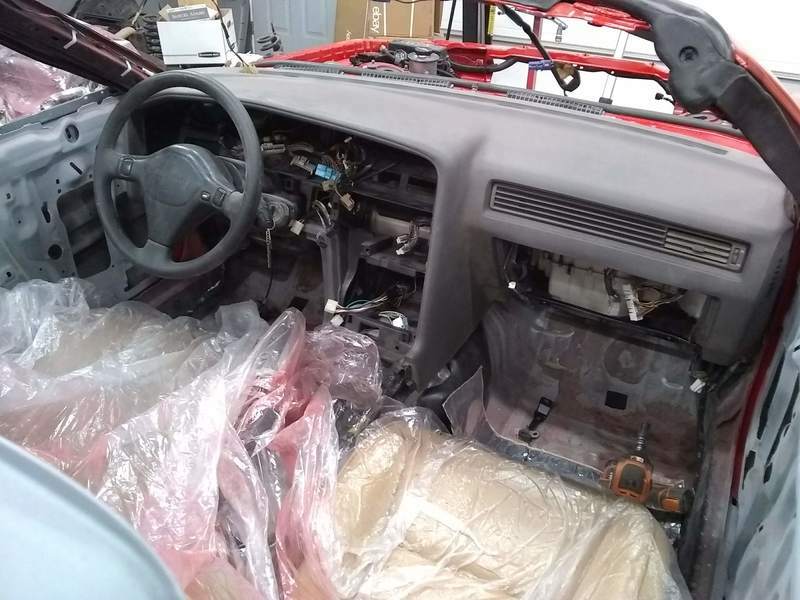 That and I want to be able to pull the engine without pulling the dash. So scratch that idea. Back to the original location it goes, but with support for the newer 2JZ style harness grommet. Re-cut the original location harness hole but oblong this time, and ground away some primer for welding. New harness plate attached. The tacks are plenty strong... just going to fill the gaps with kitty hair. The (Almost) finished product. Needs another coat of filler to fill the kitty hair pores. 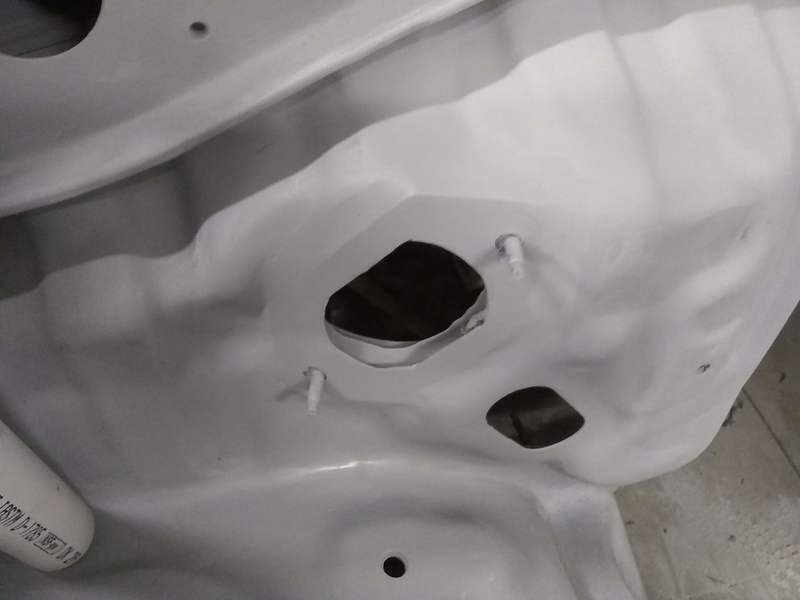 Got the new harness hole filled and primed. Filled and primed. Not perfect, but it'll do. It will be behind the head anyway. Big day today. Moved the truck stuff outside and made space for painting. 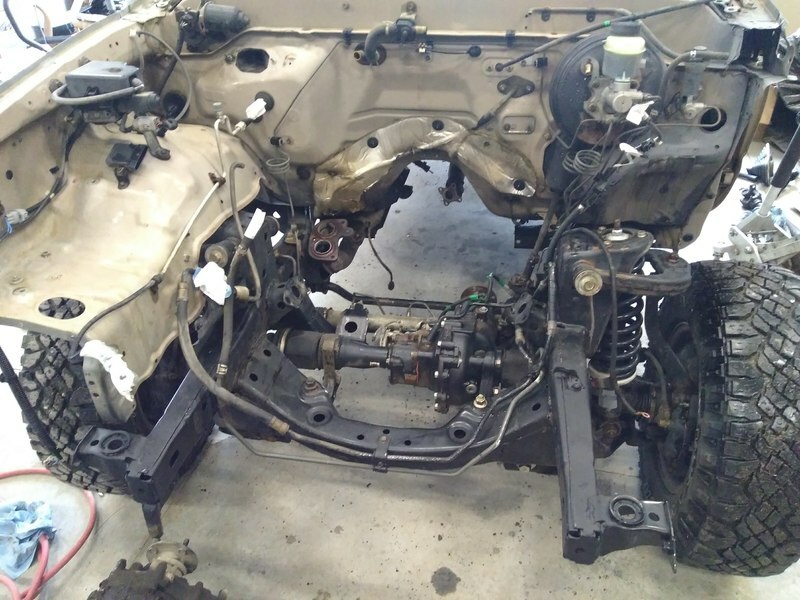 Dropped the subframe, installed RK bushings on the subframe and rack, as well as the driver side Mercedes brake upgrade. Touched up some primer defects, put down some drop cloths, and finally got some paint on this thing. It's only been 10 years since I started this process! 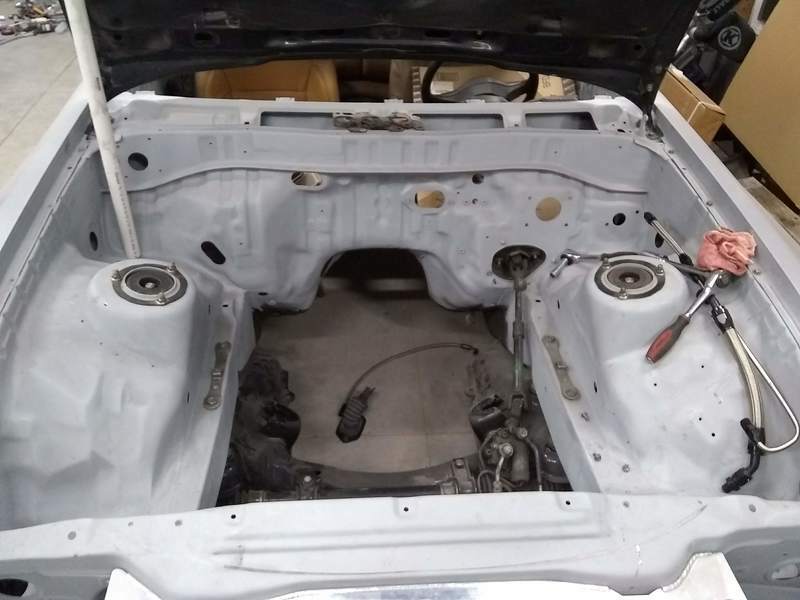 I did the engine bay, door hinges, and windshield surround. 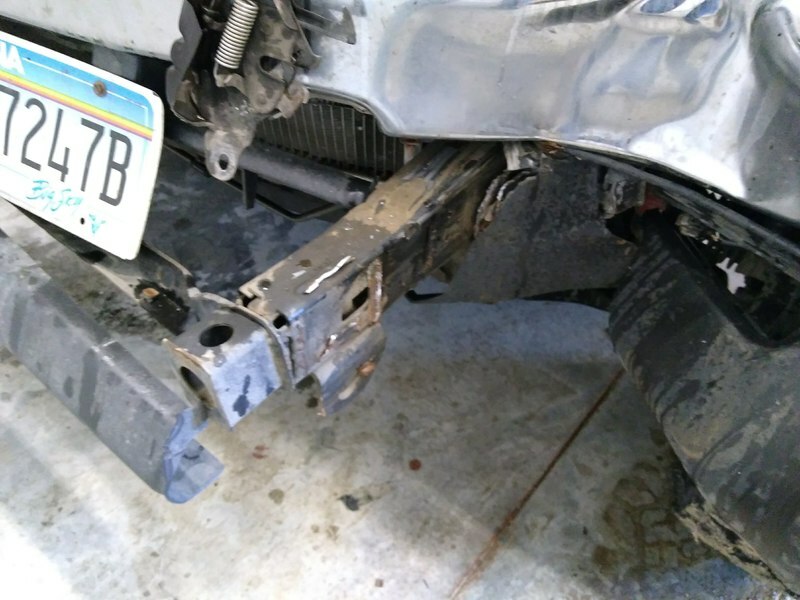 After paint, I replaced the subframe and installed the new front anti-sway bar. Will put a few more bits back on tomorrow and drop the drivetrain back in. Then it's off to storage for at least a few months. Moving back to Texas soon, and won't have a shop there. It would be nice if that DM piece was shown more in the open but none the less it's a nice touch. 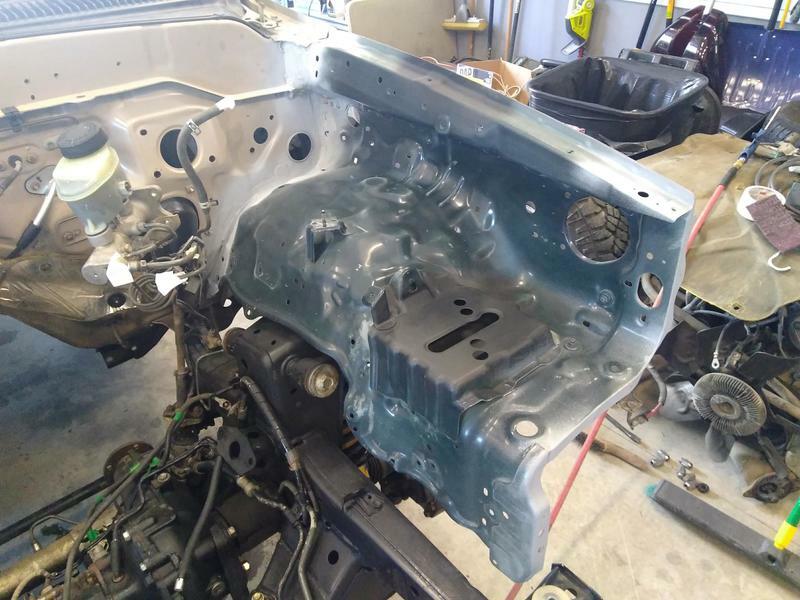 Also that paint is looking shiny and good job on the prep with the disassembly of everything so it is done right. Yeah it's a shame that it's hidden in the tunnel. Thanks! I had a number of "what the heck was I thinking" moments due to my overzealous disassembly. Like "why did I take apart the fuse box"?, "why did I take apart the relays? 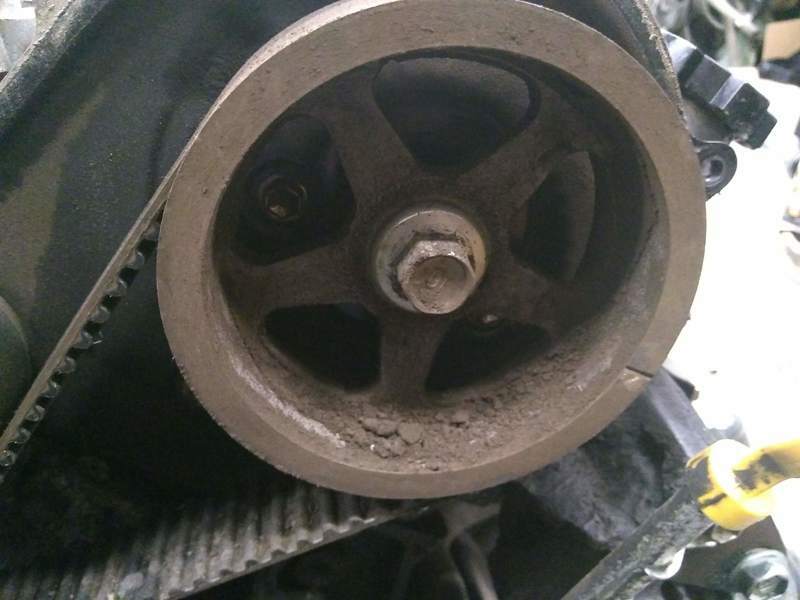 ", "why are the brake booster nuts not with the brake booster? <-- I still haven't found them. I also got brake and ABS lines hooked up in the wheel wells. That's probably about it until after our move. I'd like to get the doors jambed and guts installed but I don't know that time will permit. I should probably do that first if I am going to, so that I don't have to re-cover everything due to overspray. But schedule is tight and I have another vehicle to finish also. Are you doing the paint work yourself? If yes, I would love to see your setup. Yes, but my setup isn't anything too special. I think I've described it earlier in the thread. I have a 60 gallon air compressor and a Harbor Freight HVLP gun set. I used the small detail/touch-up gun for the bay as I wanted more control over a large fan-out. Though I wish I did, I don't have any sort of booth setup. My strategy has just been to move everything far enough away and cover things I don't want to get overspray on with drop cloths. I still have a red mess to deal with. When it comes time to paint the outside panels, I plan to find a booth. Especially with this single stage paint, it's particularly bright and tenacious - base/clear is usually a bit less of a mess. thanks, I was thinking it might be in the thread somewhere. Yeah, I was wondering if you had some sort of booth or canopy setup. Of course I cannot see any dust from an internet picture, but your results seem very nice. No trouble with dust nibs in the paint this go-around, just red dust everywhere in the shop. I'm pretty pleased with the Kirker paint, at least so far. I used SPI clear on the Tacoma and it came out pretty nice too, but it did have quite a few nibs and will need to be sanded out to be perfect. Damn nice resto work. I have to know: how do you paint in your garage without making a mess everywhere? Well... you don't. But I use drop cloths to keep it off of anything critical. I do still have a layer of red dust on everything in the shop now. Got everything under the dash installed as well as the dash itself. It'll have to come back out as I'll be painting it black but I don't have time any more for "since I have it apart I may as well...". That is what got me into a now 13-year car project that has barely been touched for the last 7. So right now the focus is to get it back on the road as quickly as possible and work out some other details later. Also dropped in the drivetrain. The rear trans mount fits over the AR5 nicely, just need to make a bracket. The trans fits in the tunnel just fine with the extra meat removed. I see I'm not the only one getting back to their supra after years , I just got back on mine after 7 years almost. Great work man!! The progress looks great. I've been looking for R154 replacements myself. Well, we're back in Texas again. The supra got a windshield for the trip. Loaded up on the wrecker to go to the glass shop. The joys of living in a small town. Only one glass shop in the area could get a Supra windshield in time for the move, and they don't do mobile installs. Back from the glass shop. First time in 10 years that she's had a windshield. 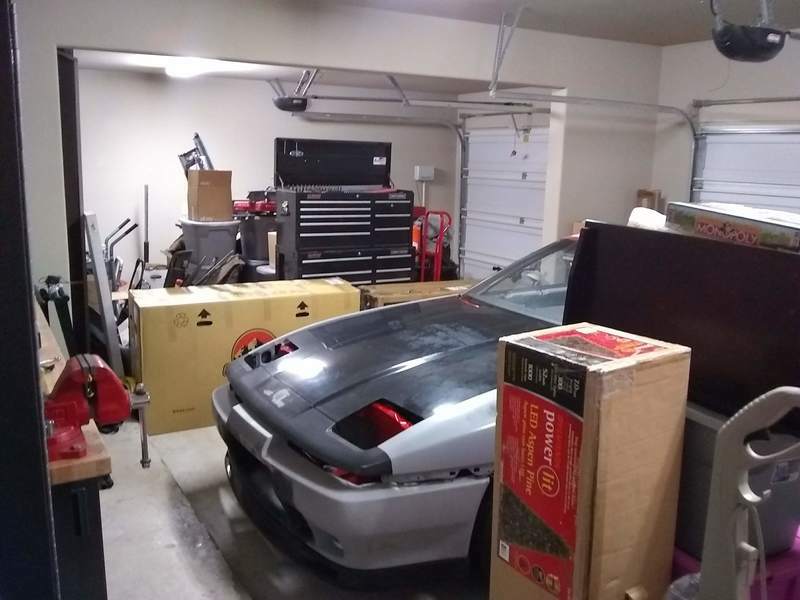 We did U-Pack for our stuff and I used U-Ship to ship the Supra. They didn't show up on time so I had to leave the car with the neighbor. Finally they picked it up a week behind schedule. I had my cousin throw some tarp pieces over the door glass openings since I wasn't able to get the glass installed in time before leaving. So much for that idea. Thankfully, due to the 1-week delay, it missed the torrential rain that we drove through on our way down. So the delay turned out to be a blessing. 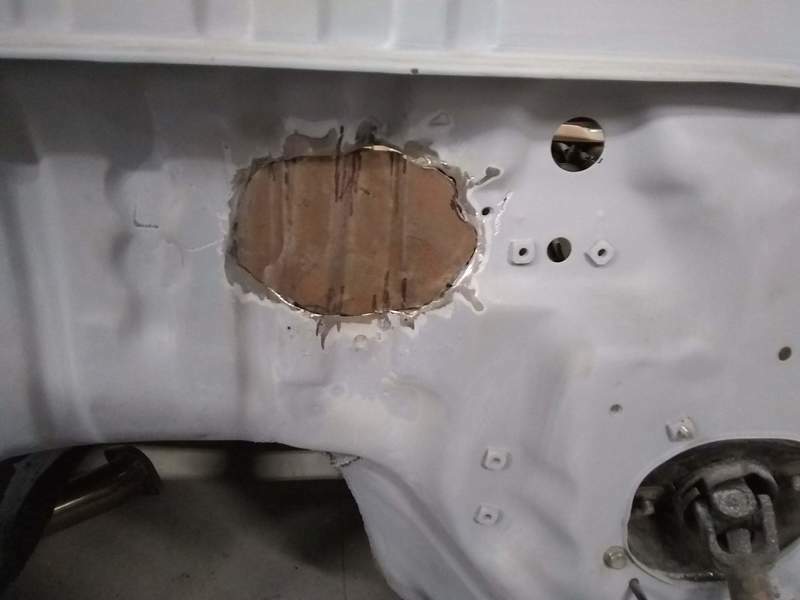 Despite the gaping holes, the car was dry inside. Maybe some day we'll be settled and I'll do something with the Supra, but it likely won't be soon. 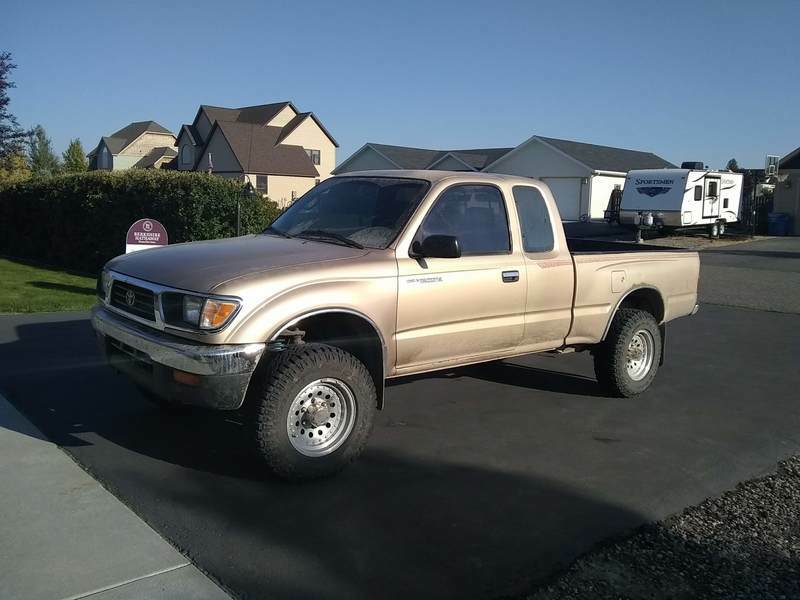 I'm contemplating getting out of it for good now, and getting something that I can actually drive. 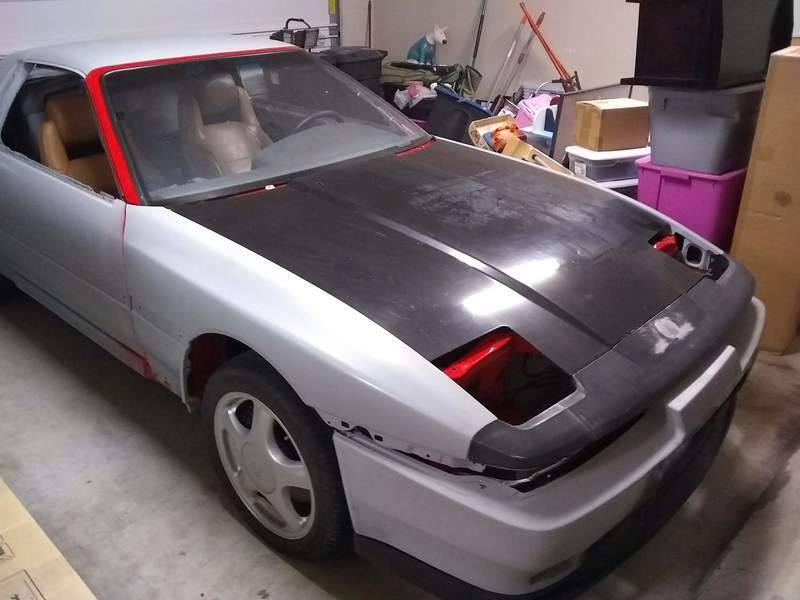 Maybe another Z-car or new '86. Or -gasp- a coyote Mustang. At my "spare time rate" it'll probably be at least a couple years before I'll be there with this one. Glad to hear it made a safe travel. On that windshield were you able to find a new one or a used one? I like that they replaced all the black trim around it and made it one piece now. It's a new windshield. TriVal is the brand, it's a Pilkington line... it's the only kind I was able to find. 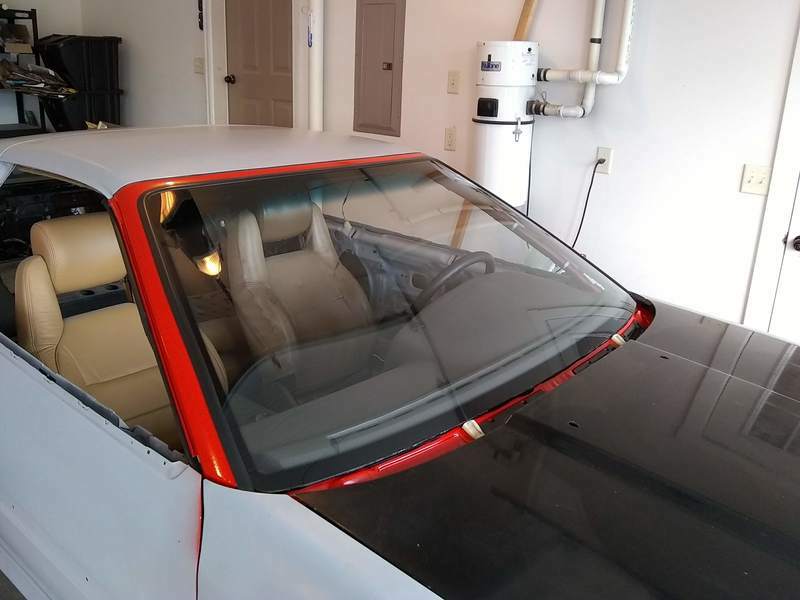 My original windshield trim was trashed or I'd have used it, I don't mind the one-piece molding if done right but the OE trim in good shape fits the character of the car better IMO. Maybe I can enlist the help of dok33 or rajunz one of these days... not sure too many others are still around.